I don’t know about you, but that doesn’t look exactly “ice free” to me. In fact, if I was anything other than politically correct, I could swear it looks colder. Surprised? Not me, for I’ve been watching the views offered by such wonderful cameras for years. However when I first began watching, yes, I was surprised, for the newspapers made the arctic sound much warmer than it actually has been, and never mentioned when it became colder, as the observations of this post may, perhaps, display. The latest “army” data from this camera state the temperature is down to -6.46 C, (20.4 Fahrenheit,) and, as that is well below the freezing point of the salt water under the ice, let alone the fresh water the ice is made of, I don’t expect to see any melt-water pools, such as last year’s view shows, any time too soon. As you look at various sources you start to notice they are not in complete agreement. It is important to notice the disagreements, and to try to figure out what causes them. Causes tend to be things as simple as the use of different thermometers at the same site, or a chart which automatically updated using data which is old or (worse) missing. In some cases the data is “modeled” rather than actual, or includes “adjustments” which you may or may not agree with. 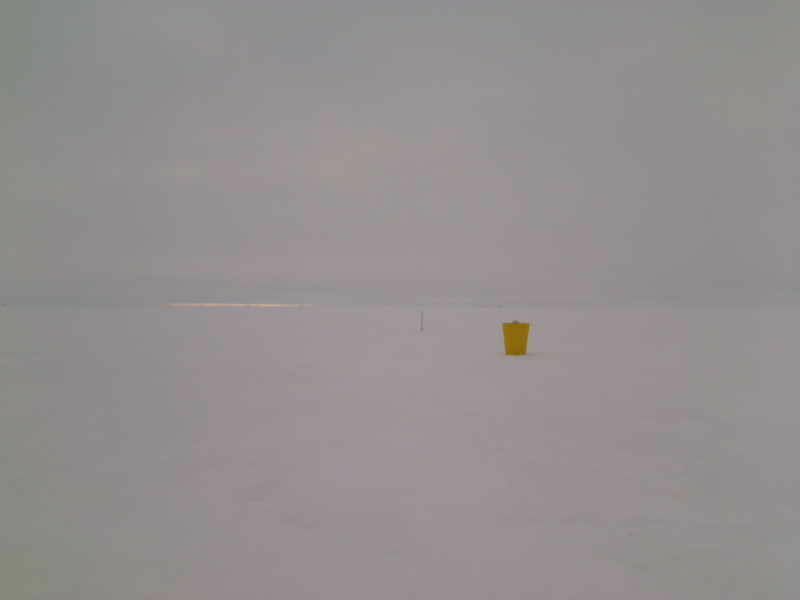 I like to glance at temperatures at nine buoys, (including the buoy at our camera,) at http://imb.crrel.usace.army.mil/newdata.htm . 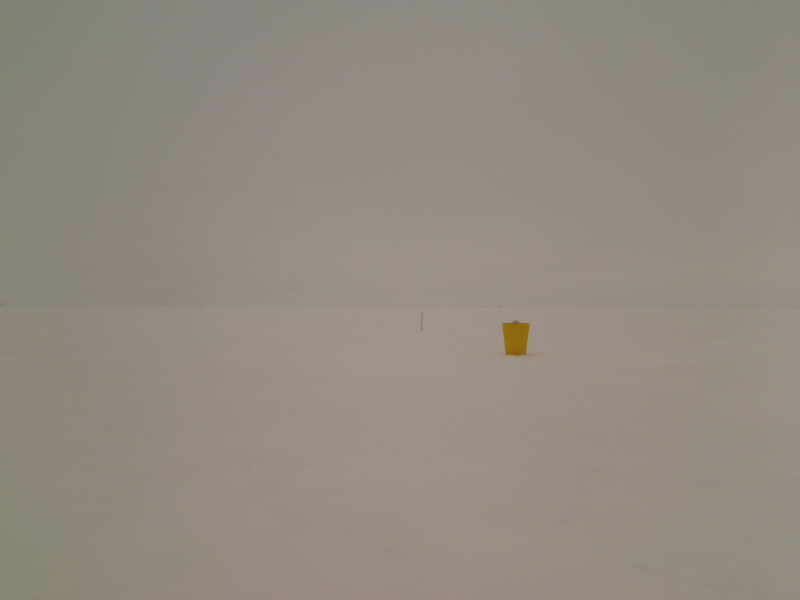 I call this data “the army data,” and this data tends to be more current than the other camera data, issued once a day at http://psc.apl.washington.edu/northpole/index.html , which I simply call “the data.” For reasons I’m unsure of the two data can vary slightly. 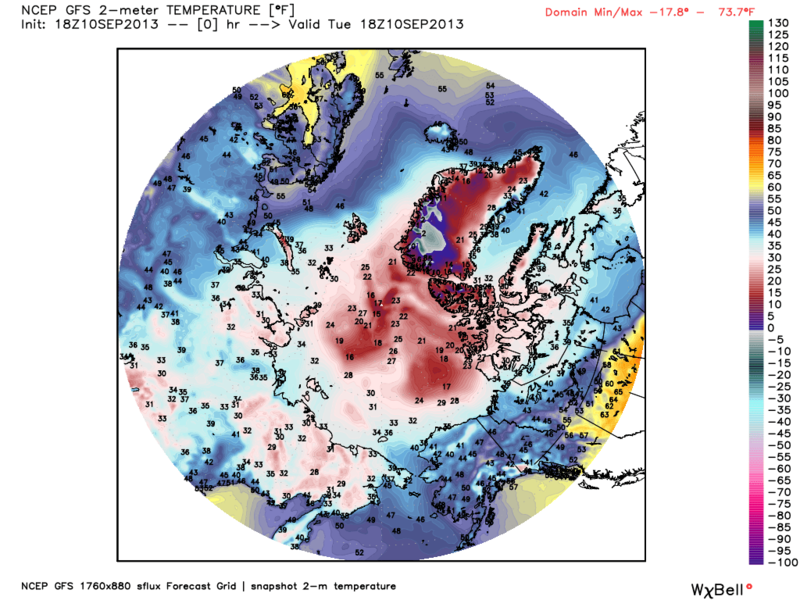 For a quick glance at the weather map of the north pole I visit http://www.weather-forecast.com/maps/Arctic , but you have to be careful because they, in their hurry to crank out not only the current map but the ten-day model-forecast, often mislabel highs as lows and lows as highs. There are many other sources of data, including the actual satellite pictures from outer space, which I sift through when I have time, and I will try to give links as I go. The frost ought sublimate off the lens as the sun works around, though temperatures seem likely to remain below freezing. 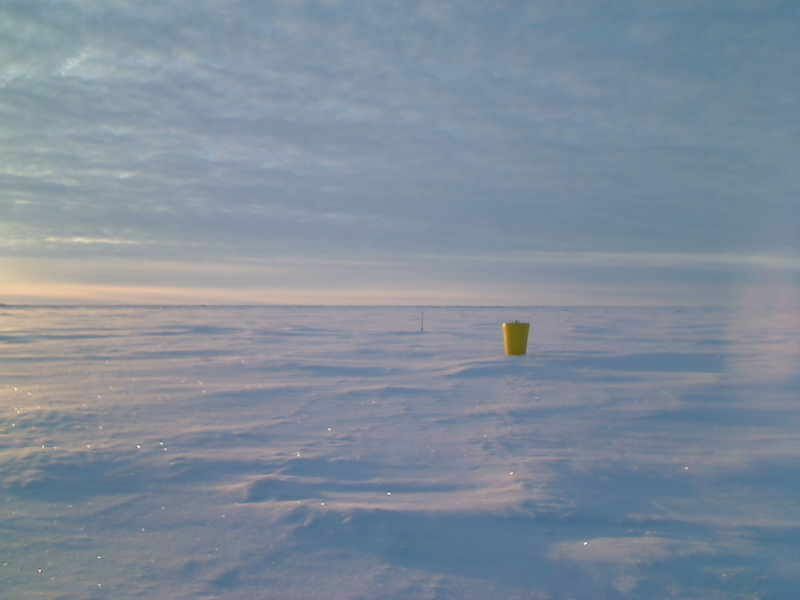 The “army” data shows our camera at -6.46 C. The “companion buoy” Buoy 2013B: , located roughly 100 miles north of our buoy, has dropped sharply from a hair above freezing yesterday to -4.94 C.
I am going to be busy today helping my youngest move into his college dorm down in Boston, but will briefly note the temperature map shows the sub-freezing isotherm creeping south east of Greenland towards the north coast of Svalbard. 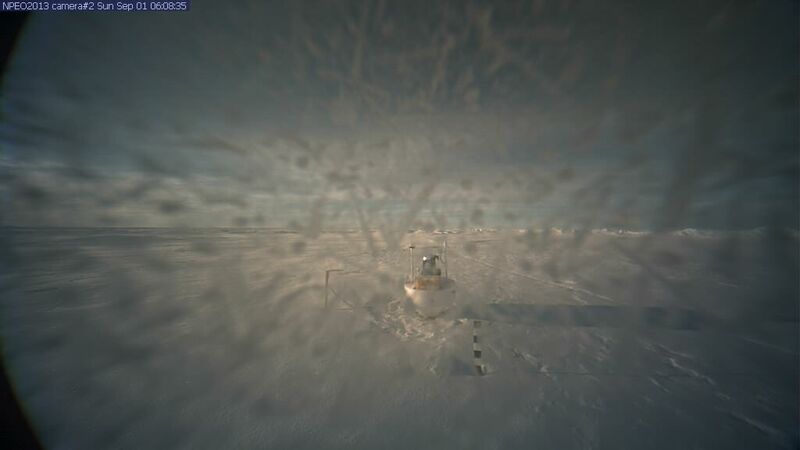 Lord, am I ever glad to get back to the quiet of the North Pole Camera. You’d think there wouldn’t be much traffic in Boston on a Sunday, but it was at a standstill on Storrow Drive along the Charles River. There was some sort of parade involving the BU home opener, and mobs of college students driving U-hauls and pushing large hampers on wheels on sidewalks, as Boston has a plethora of colleges all opening at once. Took a wrong turn at the exit and found myself passing through a mob of fans streaming towards a Red Sox game at Fenway Park. Then had to do a lot of unloading my son’s belongings into one of those hampers-on-wheels thingies, and rattle along sidewalks in steaming summer heat, all the while secretly yearning for the cool of the Pole. So here I am. I click on to the picture, and what do I see? What the heck has been going on around here? 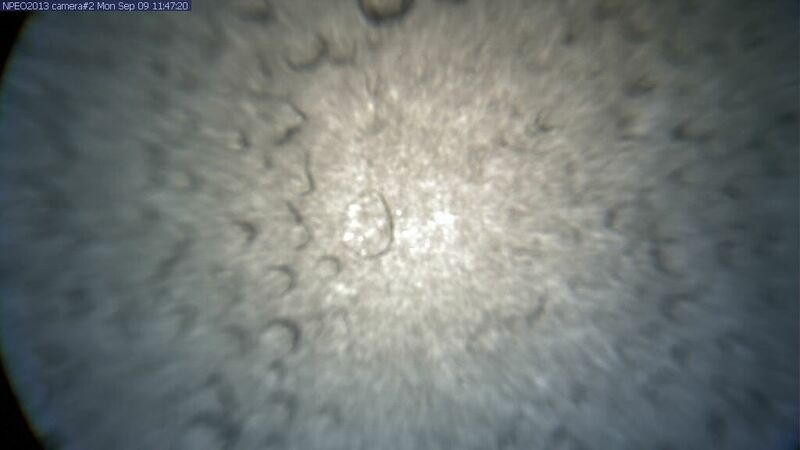 I left things neat and tidy and more than six below, and come home to find drops of water on the lens? Can’t people manage things around here without my constant attention? Even our camera has been loafing, as soon as my back is turned. For some strange reason there was no 12z picture taken today. 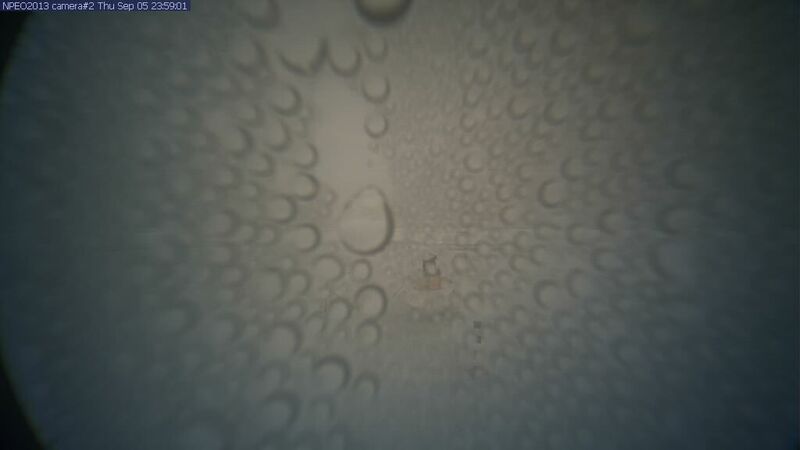 There is just the 6z picture with frost on the lens, and the 18z picture with drops of water and fog. Obviously I’m going to have to study a bit to figure out what the heck has been going on. EVENING DMI MAPS (click to enlarge) The pressure map shows an unusual symmetry that breaks certain rules. There is suppose to be either a low dominating the pole, or a high with lows dancing around it, but tonight we see two lows and two highs doing some sort of bumpkin square dance. Someone needs to have to talk with those weather systems. They may be quaint but they are out of style, and likely politically incorrect. 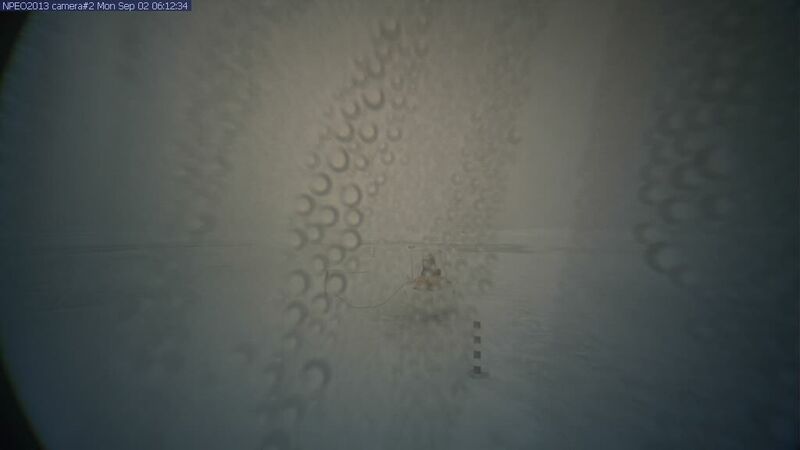 The high I dubbed “Igor” and low I dubbed “Ronald” continue their battle on the far side of the Pole, with the winds between them thrusting a relative mildness north, which has cut the sub-minus-five isotherm into two blobs. (The upper one is the “chicken,” and the one laid atop Greenland is the “egg.”) Meanwhile the extention of Igor that blurbed off Greenland, was seperated from Igor by a definate col, and now deserves its own name, a high pressure area named “Greenie.” Greenie built such magnitude it pretty much squashed the Icelandic low Thidwick under it flatter than a pancake, but keep an eye on Thidwick, for he is getting squished east as an impulse, and something is brewing in the Baltic. Behind Thidwick his son, “Junior,” is strengthening west of Iceland, and rather than following in his father’s footprints Junior may creep up the east coast of Greenland as Ronald did, and we may again see Atlantic air try to invade the Arctic, as a flow between Junior and Greenie. Each time these flows become cross-polar, you can expect the DMI graph-of-temperatures-above-80-degrees to go positive, as the really cold air is driven to the side and south of 80 degrees. The fact that graph is “above normal” does not necessisarily slow the refreeze, because the colder air may be driven to the edges of the ice where it can actually hasten refreeze. 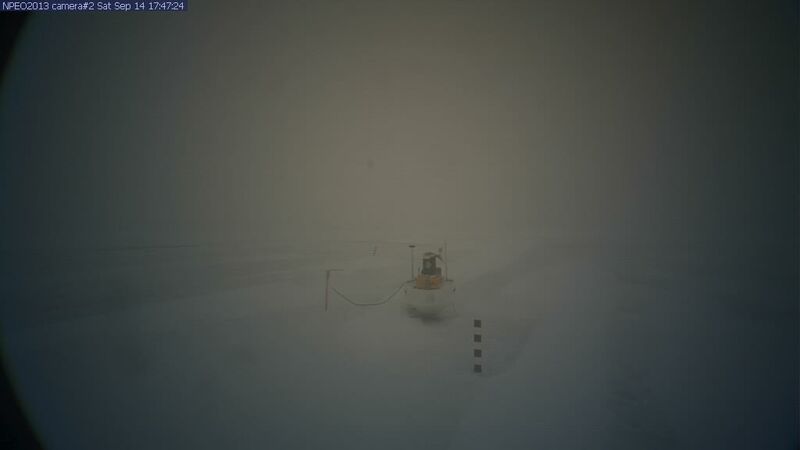 While the Pole can export cold air, it can never really import it until the tundra becomes snow-covered and dark. At this point all the cold air is home-grown, in areas that are clear, calm, and undisturbed by southern invasions. To a certain extent we have seen Igor be such a cold-generator, away from his conflict with Ronald, as is shown by the large area of sub-five-degree air away from Ronald. The low pressure north of Greenland is “Baffy,” (after Baffin Island,) and tends to be a semi-permanent feature west of Greenland, partly because the water there is relatively warm compared to Greenland’s icecap, which forms a semi-permanent area of cold and usually-descending air, due to being permanently over 10,000 feet tall. When Baffy bulges north against a high like Igor, cold air gets exported down to Canada and Alaska, and that is the area I’d expect to see the greatest refreeze, in the near future, as some truly cold air gets nudged down that way. 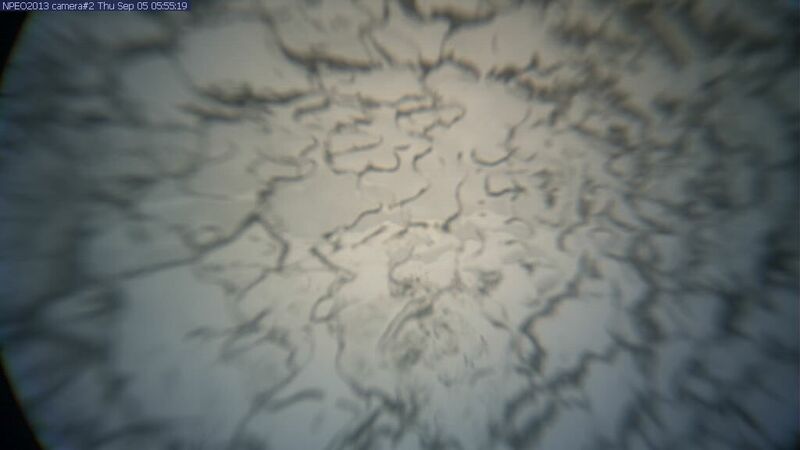 The sneak attack of thaw at our camera was likely imported from Siberia between Igor and Ronald, and was something I suspected might happen, and even predicted, but when temperatures plunged yesterday I figured I was wrong. As usual, as soon as I stop expecting something, it happens. 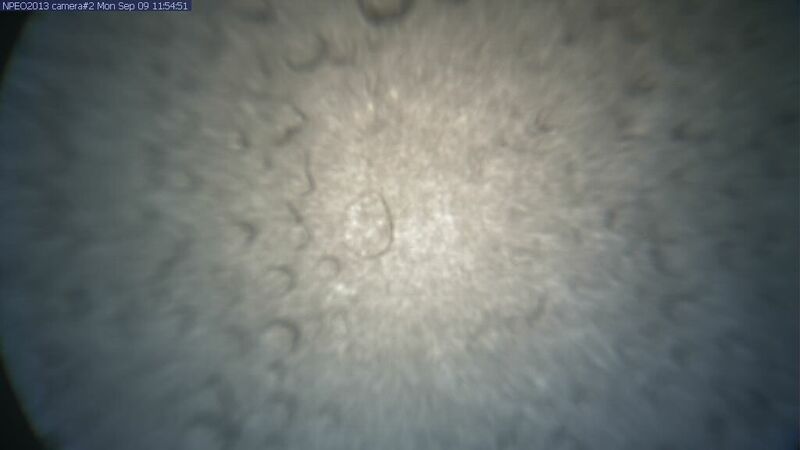 Now I need to study the data from the camera. 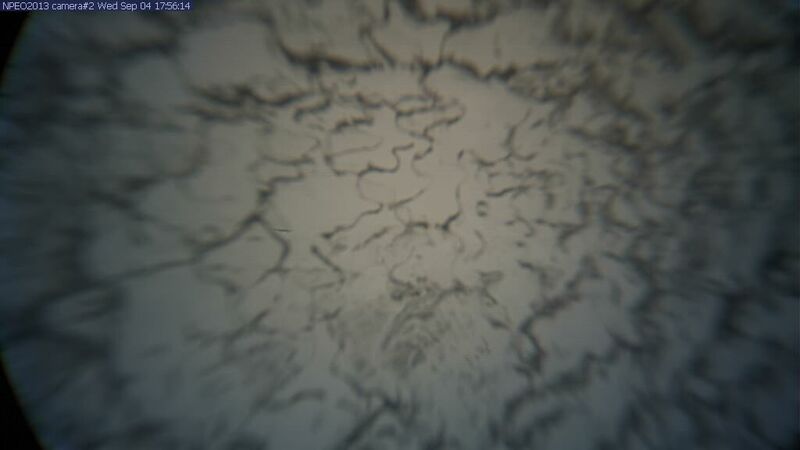 The picture shows thaw as well. 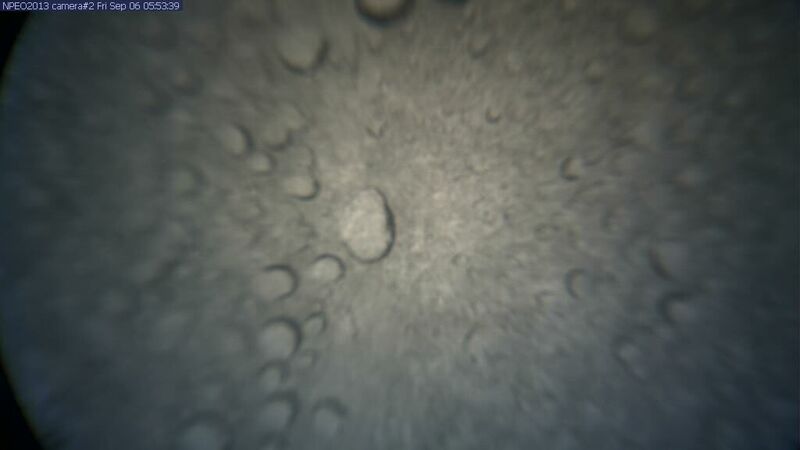 It’s difficult to see much, but there may even be some melt-water pooling in the distance if much rain is falling. 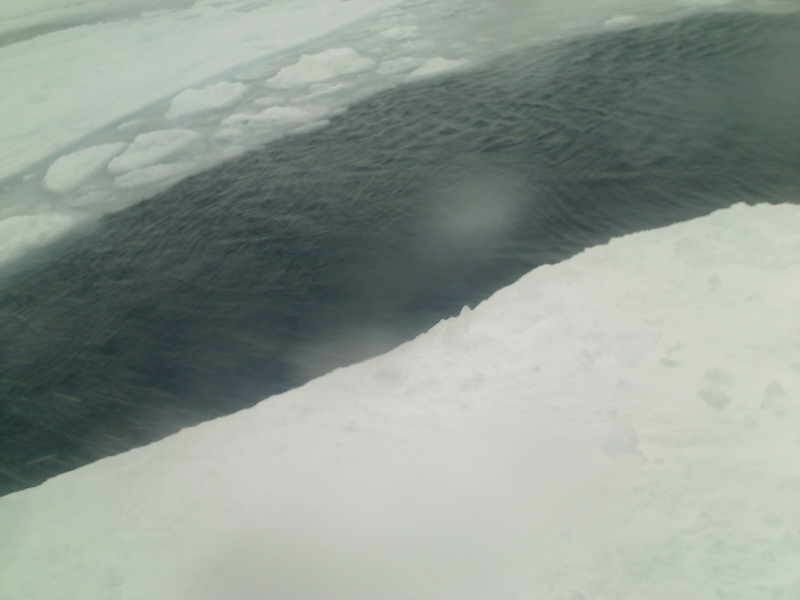 It would be that grey area, likely a thin layer of water atop the frozen surface of a melt-water pool from earlier in the summer. Air is being injected to the Pole from two directions: From the flow between Igor and Ronald, (IE from Siberia) and the flow between Greenie and Baffy, (IE from Greenland) The flow from Siberia has been dominate but is weakening, and a new and interesting flow from the Atlantic is developing. Computer models keep arriving at the solution of a storm over the Pole, but keep changing the manner in which it comes about. 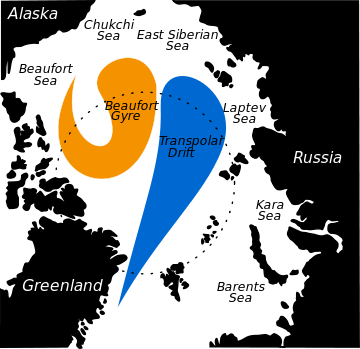 Originally “Thidwick” was suppose to travel to Siberia and take a sharp left turn, however now models say what is left of poor Thidwick is squashed to the Baltic and then southeast out of our view, as Thidwick Junior travels up the east coast of Greenland, curves over north of Svalbard while weakening, and then restrengthens and moves right over the Pole next weekend. The fuel for restrengthening will be supplied by the fact Greenie will hook over Scandinavia and latch up with expanding high pressure bulging up from the Azores, perhaps giving Swedes a final chance to tan, but also creating a corridor of Atlantic fuel for the storm, a long fetch of southwest winds up the west side of the high pressure ridge. Of course, the next run of the model may have a totally different solution, but this last one is interesting. Such a storm could shift a lot of the jammed-up ice back into the open waters north of Svalbard, and also transport a lot of heat away from the surface to lose latent heat in the upper atmosphere and create cold. That’s what the last storm seemed to do, over the long run. 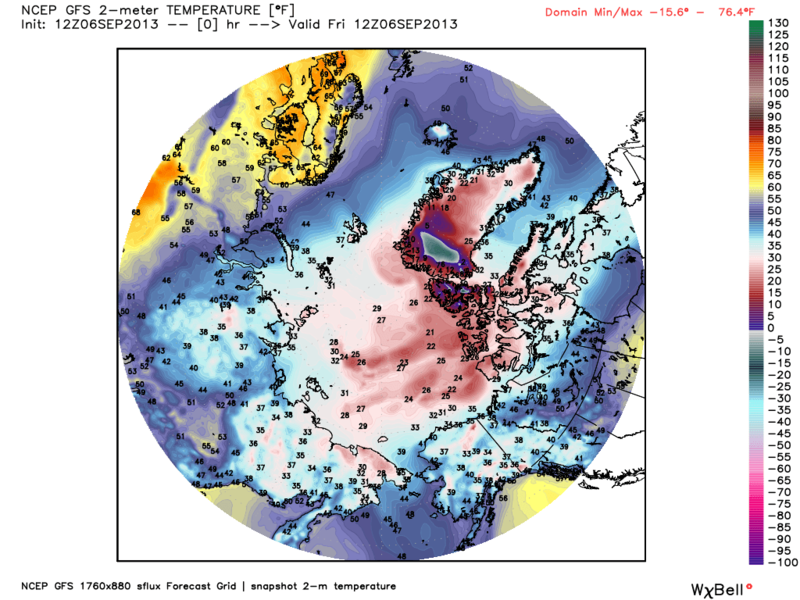 It seemed to create the cold that gave us such cold temperatures, (down to -8,) in mid August. Back here in reality, the flow between Ronald and Igor has spit the area bounded by the minus-five-degree isotherm into the “chicken” and the “egg.” The chicken is flapping about and getting a bit spindly, as its air bleeds south into Canada, however the egg over northern Greenland is larger, and may hatch something, as it is closest to our camera. 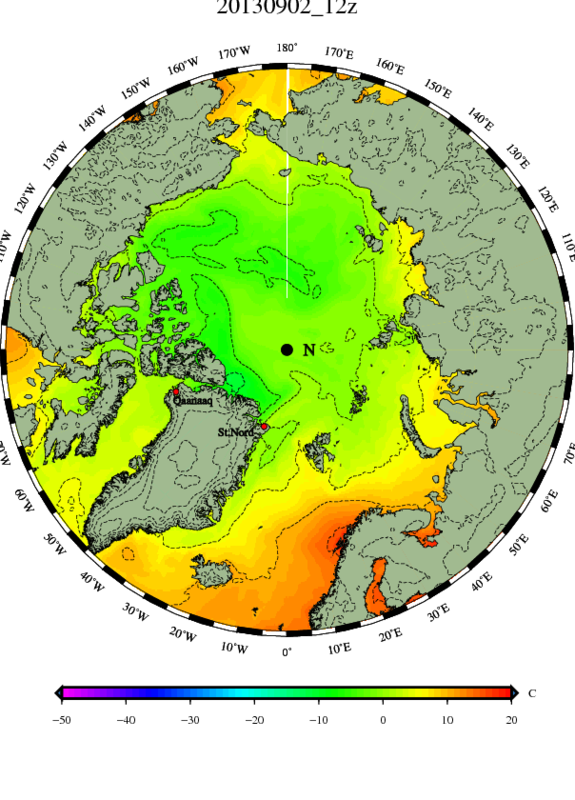 A recent paleo modelling paper concluded the temperature of the upper arctic ocean was about 2C warmer than present near the last glacial maximum. Presumably this would be because the ice cap prevented the heat being lost to space. So less summer ice will mean more heat loss to space from the Arctic ocean. This seems like a natural negative feedback to me. The increased ocean heat content of the last 80 years has to find a way out of the system. It does that by melting Arctic ice and gaining direct access to radiate into the troposphere. Once the ocean has cooled down, the Arctic ice will increase again. The world ocean started cooling around 2007, and given the momentum of the circulation systems, I would expect the Arctic ocean to lag by a decade or so. I predict signs of Arctic ice recovery starting around 2015, and becoming stronger around 2017-2019. Plenty of time for hollering and hooting meanwhile. Many of the other people were disgusted at Joe Romm for allowing Tallbloke a chance to speak, but Joe Romm went up in my opinion. Tallbloke is a known skeptic who has his own fascinating site at http://tallbloke.wordpress.com/ where he displays a scientific mind which intimidates me slightly, as I am all too keenly aware of my weaknesses in Math. Encouraged by the idea Tallbloke agreed with my ideas to some degree, I grew absurdly over-confident and ventured a sort of prediction over at the Real Science site. Already I regret opening my big mouth, (and I’m glad I used words like “might” and “could,”) but for what it’s worth, here it is: Looks like there is a chance of a storm moving right over the pole at the end of this week. (At least the models are seeing it, but we all know about models.) I think such a gale might actually increase ice extent, as the ice is packed tightly towards Alaska and a storm might spread it out like butter, and a “extent graph” doesn’t care if the ice that was 100% is spread out to 30%. That would create a slightly false impression, but might create a “bottom” to the extent graph two weeks early. Also even a cold storm like that has a lot of uplift, and turns latent heat into available heat as vapor condenses into water and water freezes to snow, and that heat gets radiated out into space at the edge of the Stratosphere (low in the arctic,) and a colder snow falls. 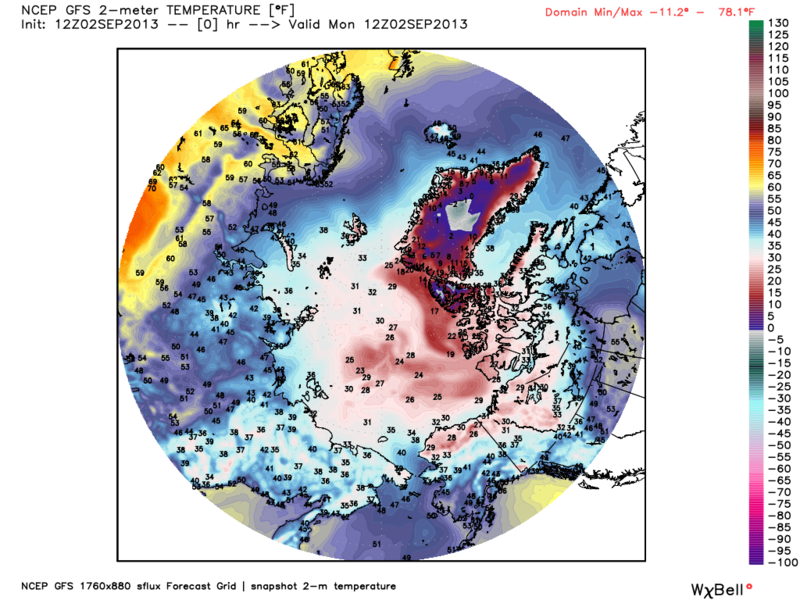 I think a storm in early August was a reason the “North Pole Camera” had temperatures down to minus 8 in mid-August. 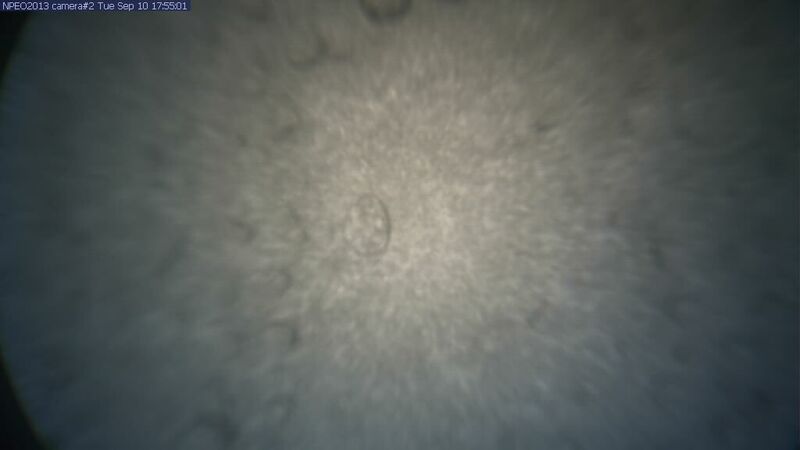 In case you are wondering, this is how a fly sees, through its compound eye. 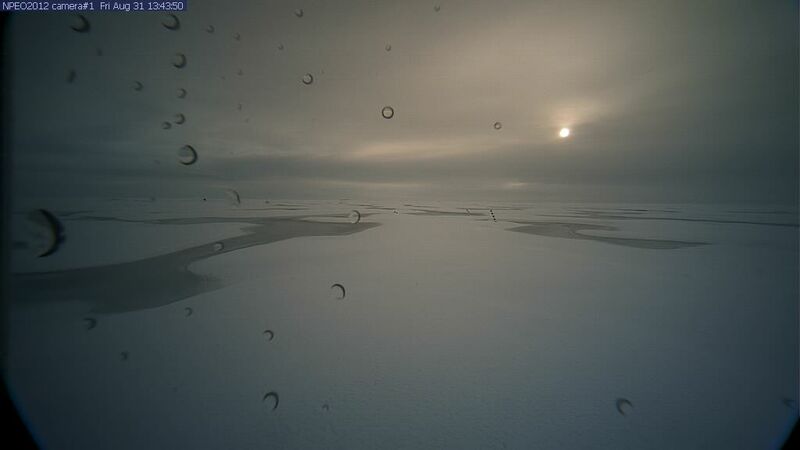 It is not the way we want to be seeing, especially as it looks like a lovely sunset-sky is out beyond the ice on the lens. However we can deduce it has dipped below freezing, at least. 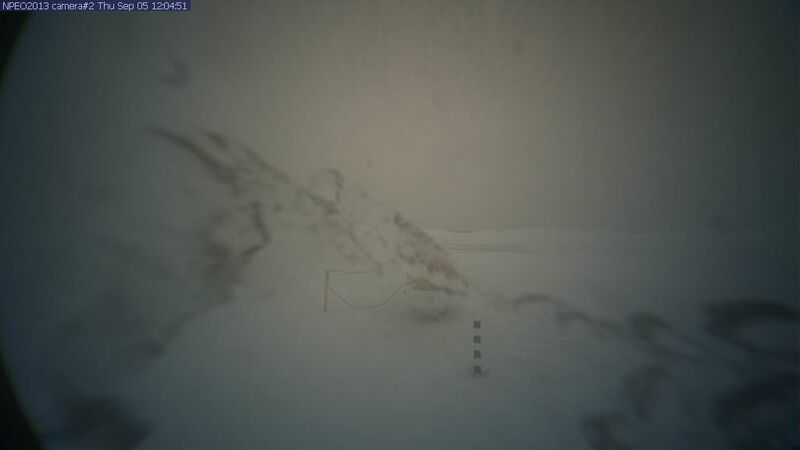 The temperature went from -0.2°C at 1500z yesterday to -0.2°C at 1500z today. No change, right? Ok, I’ll confess: It did spend all the time between above freezing, peaking at 0.7°C at 0000z, but we don’t care about little things like that do we? (I do. 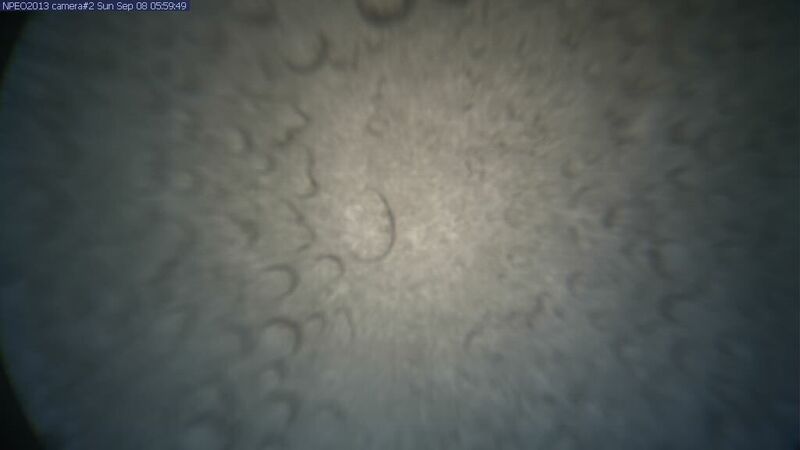 Look what that darn thaw did to the lens of our camera!) After rushing north to 83.889°N at 1500z yesterday the bouy has slowed, progressing north by fits and starts to 83.958°N at 1500z today. It might not quite make 84 degrees north, which will be a blown opportunity for a really good headline. 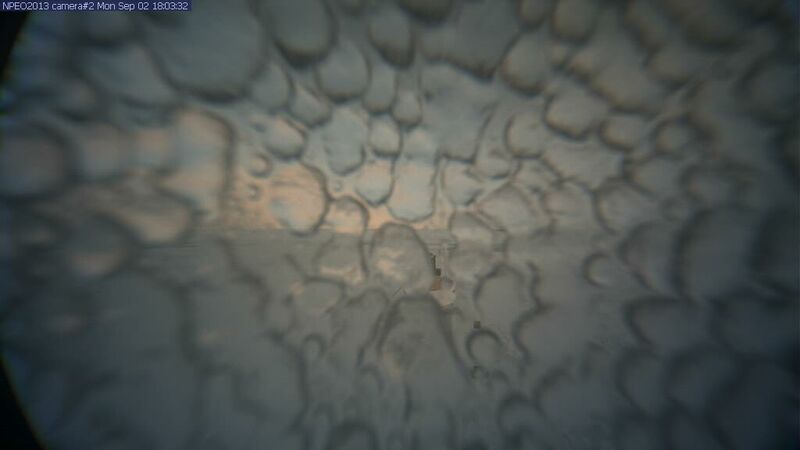 Meanwhile it has sailed steadily east, again crossing the meridian, moving from 0.484°W to 0.966°E. To our north our “companion buoy” is also moving east, but has just started south. (Crunch time.) 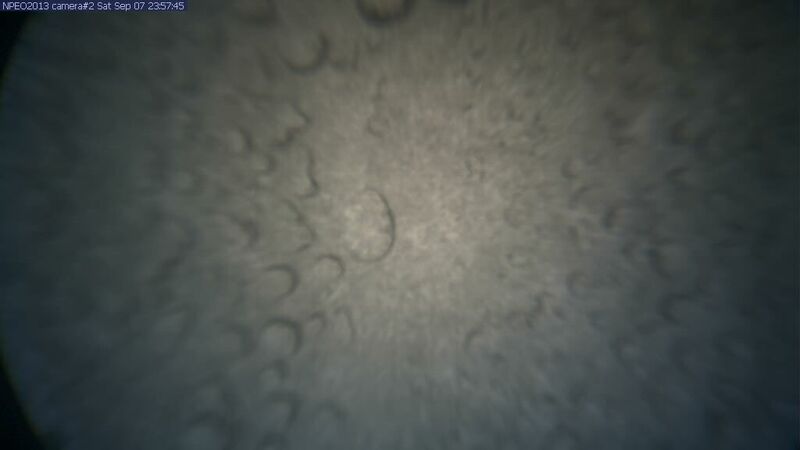 Temperatures there barely nudged above freezing to 0.1°C at 0000z, before dropping back down to -4.4°C at 1500z. Finally it is Friday! I really haven’t had time this week to goof off study the ice melt to my heart’s content in manner befitting a true goof ball Climate Scientist. My imagination is all used up by other matters, I can hardly remember what I have named various lows and highs, and I see isotherms as mere isotherms, rather than as “alligators” and “elephants.” But that is just how it goes, when you work a real job. I’m proud to say that I haven’t neglected my worldly responsibilities too badly, and made it through another week. Now it is time to play, but I can see I have some catching-up to do. 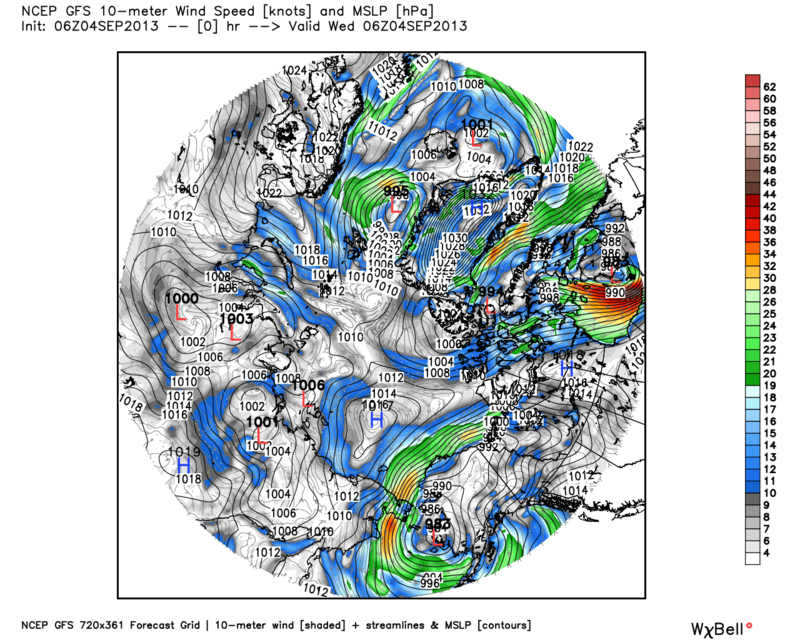 “Time and tide wait for no man,” and neither do weather maps. 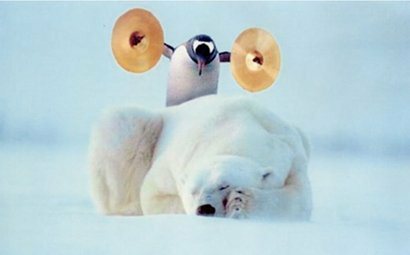 A true meteorologist must have to be on his toes at all times, for things can change amazingly if you so much as get eight hours of sleep. (Those fellows must drive their wives nuts during vacations.) 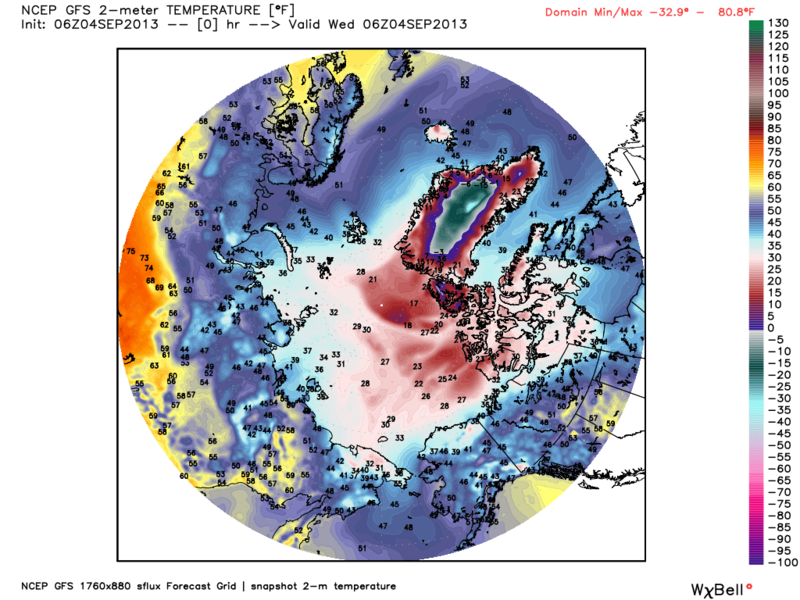 The surprise of the past week has been the refusal of the high pressure I dubbed “Igor” to quit the Pole. Perhaps part of him did drain down into Canada, but he grew an apendage back over the Pole, and the appendage grew into a new and different high pressure, and some could argue it deserves a new name. However I’m sticking with “Igor,” because that movement towards Canada was just the move of a highly trained professional boxer, a feint. It sure did fool all the computer models! However if you look back through all the DMI maps you will see general area of high pressure has never fully abdicated the Pole, despite facing some mighty tough foes who landed some mighty big blows. Now the surprising foe of Igor isn’t the low that reformed after smashing to bits against southern Greenland, that I call “Newfee.” Instead it is that innocuous low just to the Asian side of the Pole. Where the heck did that come from? It is denting both isobars and isotherms, and Igor’s arm facing Newfee is turned into a noodle. It’s a surprise attack from the side, and I’ll dub it “Azo,” for it is a dim reflection of air from the Azores that delighted parts of Scandivavia last week. Most of that air got shunted southeast through Siberia and on to China, but a hint, a faint memory, got swirled back and caught up in the flow-from-the-east ahead of Newfee, and now exists as an entity in its own right. However it largely exists as uplift. Air even remotely associated with the Azores is like a hot air balloon as the chill builds over the Pole. It is somewhat astonishing to watch the Big Chill build. Not so long ago the zero-degree isotherm had a hard time holding even half the Arctic Sea, and the minus-five-degree isotherm was absent. Now the “angry alligator” of minus-five-degree isotherms is not over by Canada, bit has a big snout right over the Pole, with a menacing (and slightly cross-eyed) glare made of minus-ten-degree isotherms to the Bering Strait side of the Pole. 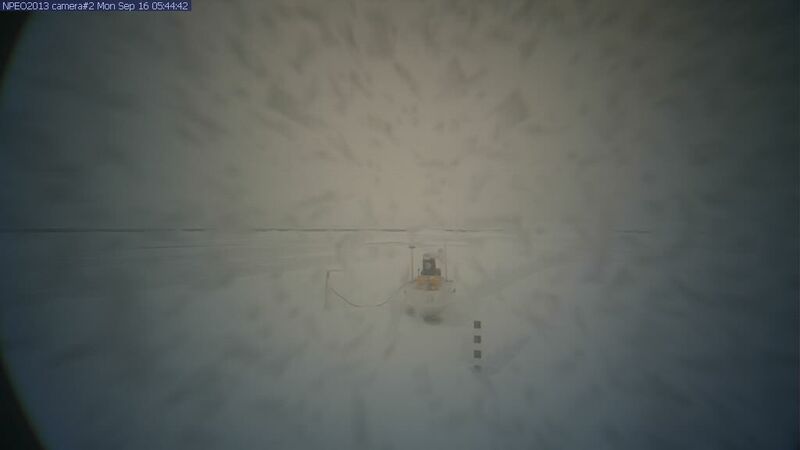 (Further toward the Bering Strait, at Buoy 2013H: , the “Army” data reports it’s now -13.29 C, but perhaps temperatures have dropped there since the DMI map was prepared.) When temperatures get that cold, the refreeze has started. Ice and water could care less what “extent graphs” say. They respond to “current conditions.” Right now in places the freeze is winning, while in others advances which the freeze briefly made turn to brief retreats. However over all the cooling is triumphing, for even where the freeze retreats the water is cooling. (The sun is getting so low that open water reflects more incoming radiation than ice does, so even when the water wins, it loses. If it drives the ice away, it cools more quickly.) 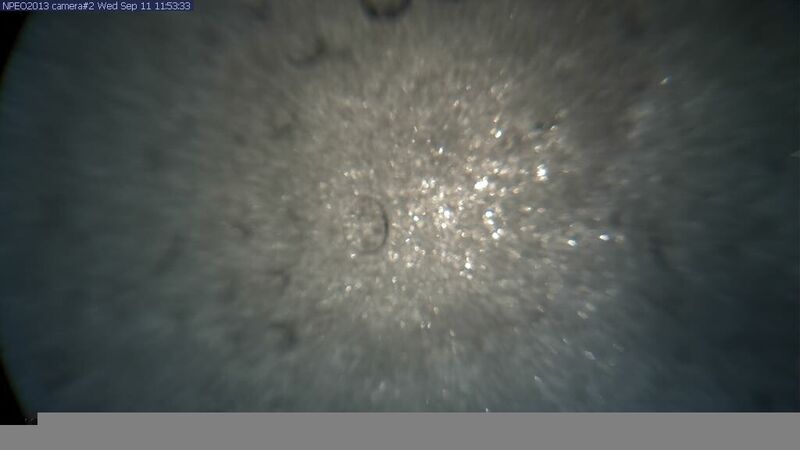 You can see this at “Army” buoy Buoy 2012L: This the buoy with the “downcast look,” with its camera aimed down at seawater that swirls with chunks of ice and masses of slush that look like they are freezing and then thawing, freezing and then thawing, at times clotted and at times ice-free. As I watched the film available at that site I could see that when the ice was forming it made a skim of ice that was later bashed and crushed and became the slush in later scenes. 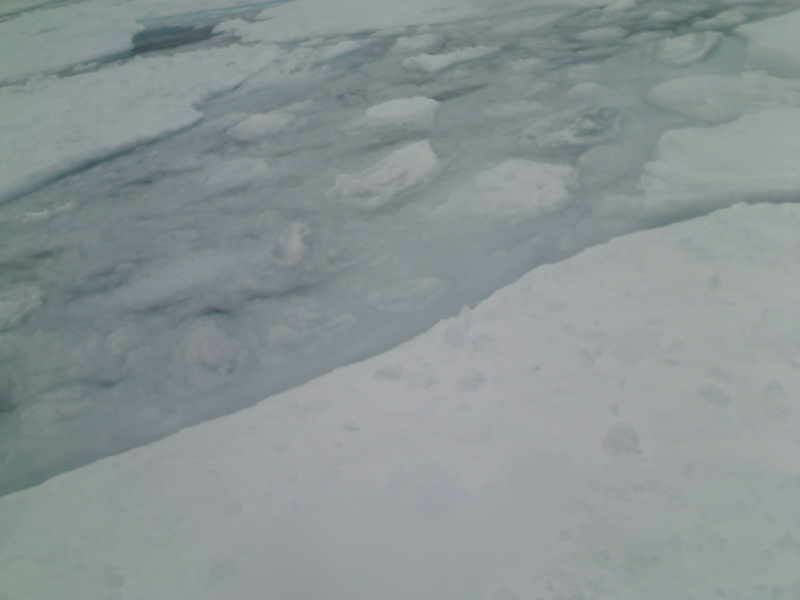 There is more and more of this slush amidst older and whiter chips of ice, making it harder and harder for wind to push it all aside and expose open water. Just recently the temperatures have been below the freezing point of salt water, but rising in the afternoon sunshine from around -6 to around -4. 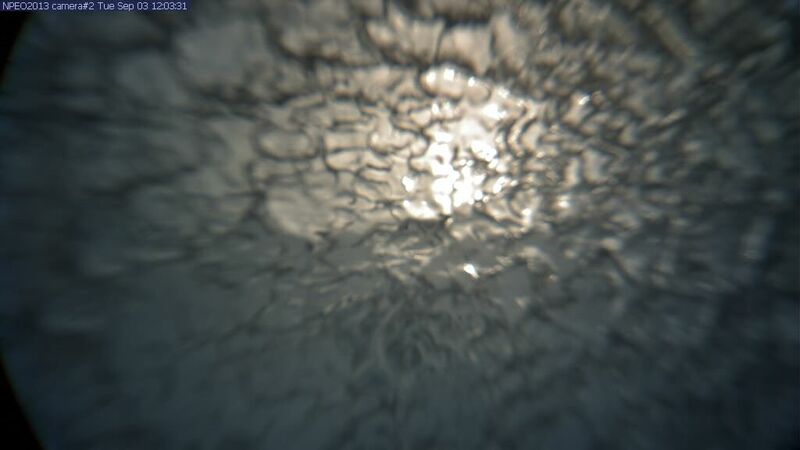 The picture filled with ice and slush next to the solid ice the camera is on, but the wind shifted and the ice nudged away, giving us a view of older ice, new ice, and water. 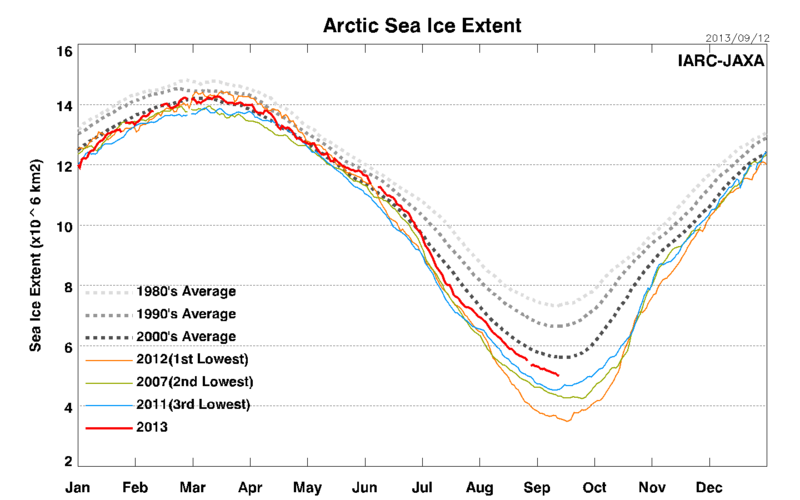 The reason that graph doesn’t tick up is because it measures 15% or more ice coverage. 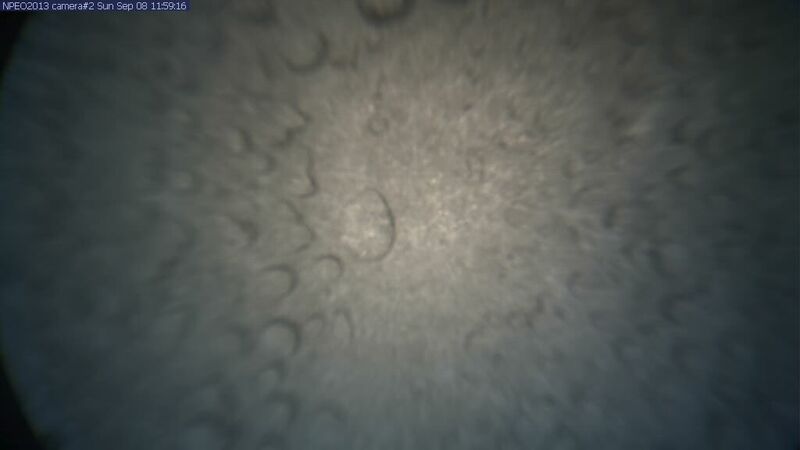 It doesn’t give a hoot if the water between ice freezes, and 15% coverage becomes, by stages and degrees, 100% coverage. 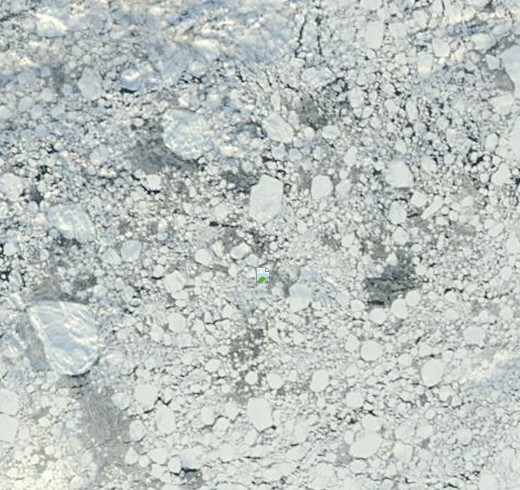 It makes no distinction between 15% coverage and 100% coverage, for what it measures is in essence the outer edge of the ice pack, where the bergs are scattered but not absent. 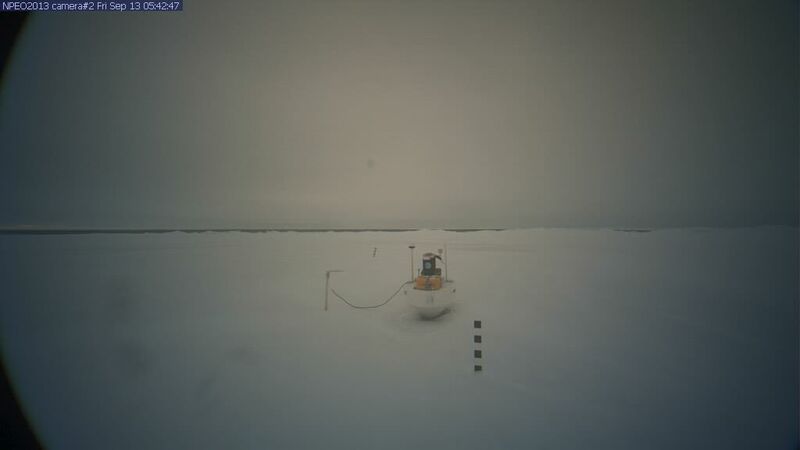 During a year like this one, where our camera heads north rather than south, the outer edge of the ice is not going to spread out and therefore increase the “extent” of 15% coverage. 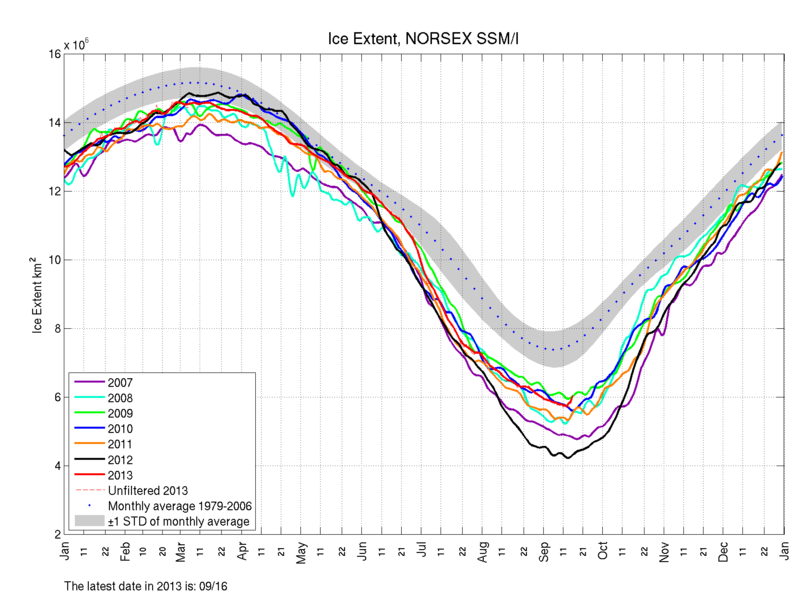 Rather the ice is going to be pushed against the other ice, and decrease the “extent” of 15% coverage. In terms of area and volume, things may be the same, but extent will show a decrease. 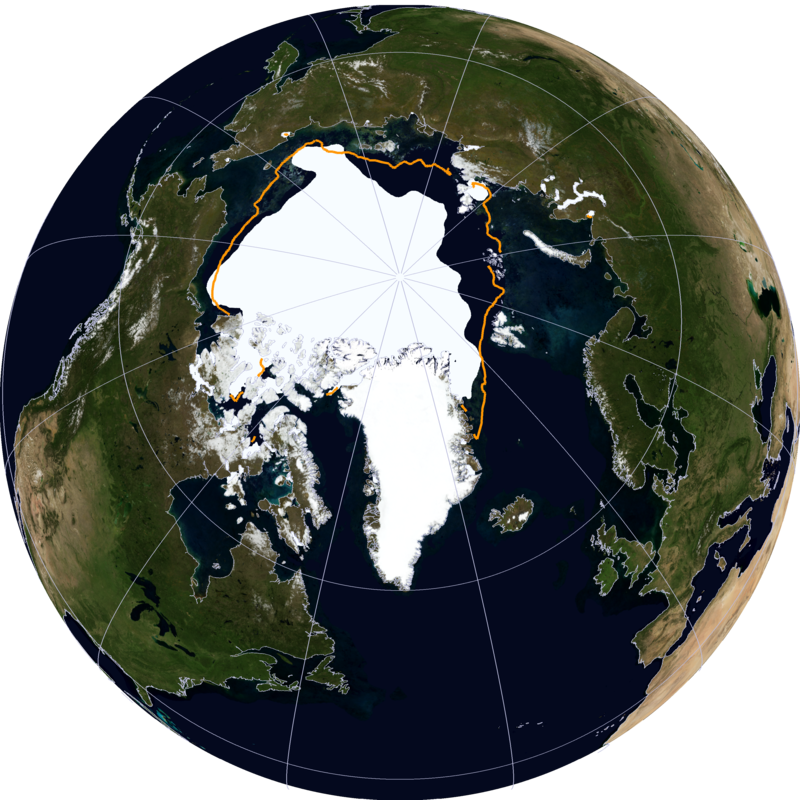 If the winds start to howl and really push that ice together with other ice, the extent may even continue to decrease even as cold temperature start to freeze the mass of jostling sea ice into a single, coagulated mass of 100% ice. I think that is what we are seeing this year. The irony is that having less “extent” means you have open sea water which loses heat more effectively than water covered by ice, as I have explained earlier, An even greater irony is that some do not actually watch ice melt as I do, but rather depend on “extent” graphs to tell them if there is more ice or less ice. (Some seem very pleased if there is less ice, and some seem very pleased if there is more.) I hate to tell them this, but this year is making extent graphs look a little bit…(dare I say it?)…stupid. 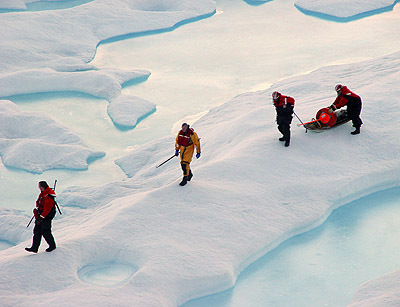 Let me state things in plain and simple terms: I may not be a Climate Scientist, but I have watched ice melt. I’ve done so for years. And this year it isn’t. Not like it used to do. In fact it is piling up. SEPTEMBER 14 —MORNING PICTURES— WHERE ARE YOU, SUNSHINE? FUN WITH MAPS. WHY SHOULD INITIAL RUN DATA VARY? I was just trying to get a grasp of the conditions at the above bouy in the above picture, and chose to look at the 0Z initial runs of the GFS and the Canadian models. Why did I look at two? Because the GFS didn’t seem cold enough at the above picture, and I was curious as to whether the Canadians had a better comprehension of cold. The maps drove me a little crazy at first, as one has Greenland at the top and the other has Greenland at the bottom, however the Canadian map did make it look colder in the area of the above picture, and I seemed to notice other differences in the two maps as well. That puzzles me. 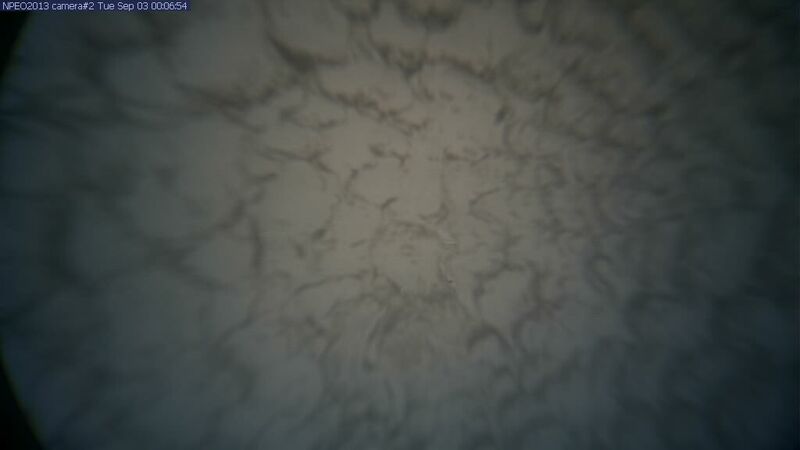 At 1500z yesterday our camera had touched 84.000°N. but not officially crossed it. 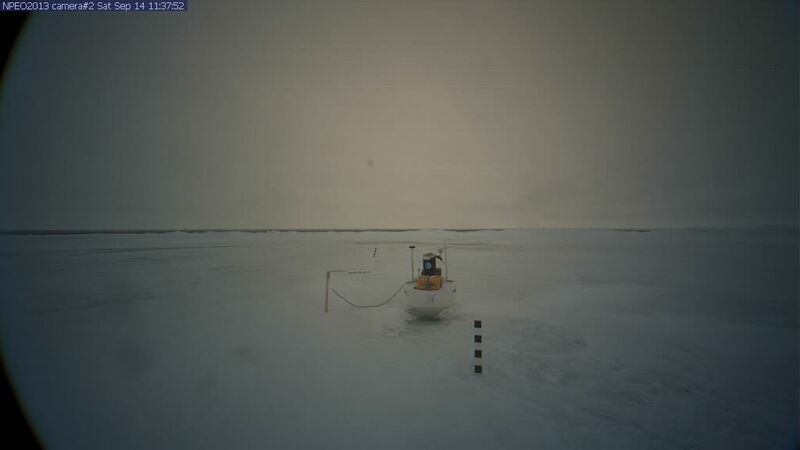 At 0000z today it officially reached 84.012°N, which means it had crossed 84 degrees for the ninth time, and then the strong winds shifted from east-southeast to east-northeast, and the bouy drifted back south and crossed 84 degrees for the tenth time, reaching 83.963°N at 1500z. The stiff breeze blew between 15 and 23 miles per hour, (likely with higher gusts,) and the westward movement was pronounced, from 1.666°W at 1500z yesterday to 3.914°W at 1500z today. Just think of it! Yesterday we were in a whole different hemisphere! The meridian is now far behind. 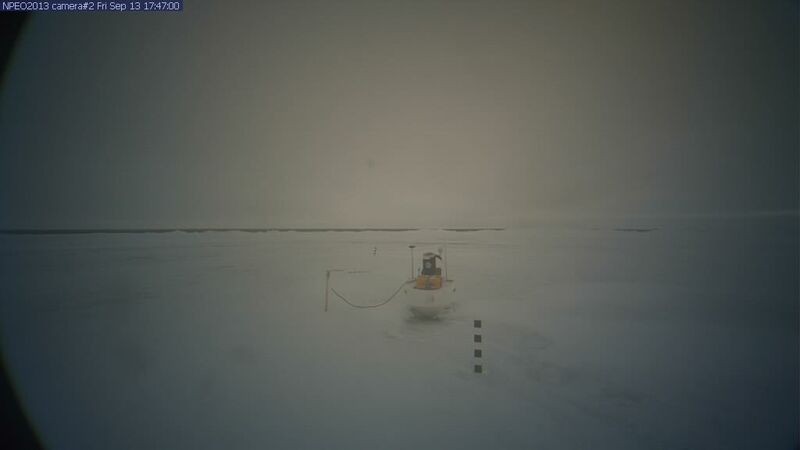 So far no milder air has come up from the Atlantic Gale “Newfee” to the south, and instead temperatures dropped from -2.4°C at 1500z to -6.7°C at 2100z yesterday, and stayed cold all night, rising slightly to -6.1°C at 0600z and then rising more with the dim daylight to -4.0°C at 1500z. If it fails to fall as the sun goes down we can assume some Atlantic air is seeping up, but with the wind backing to the northeast we might get colder air from “Igor,” or perhaps some of that stripe of slightly milder air from “Azo.” Time will tell. It looks pretty gloomy for lunchtime. Our camera needs a flash attachment. We also need sound effects. 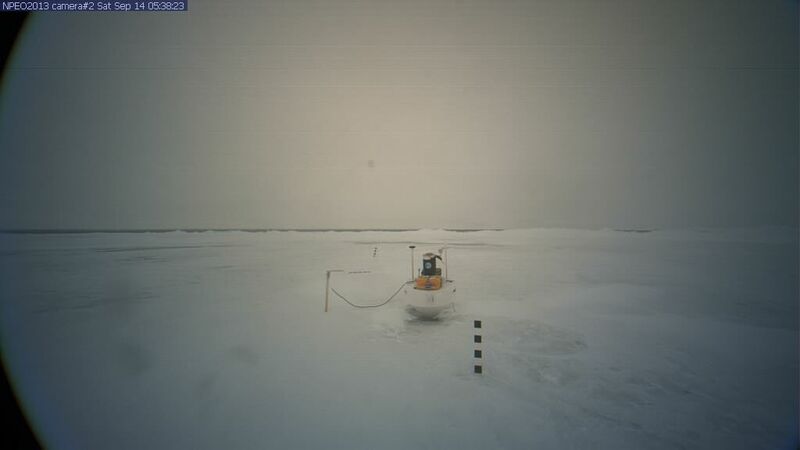 There should be the sound of wind blowing, and perhaps the ice groaning every now and again. 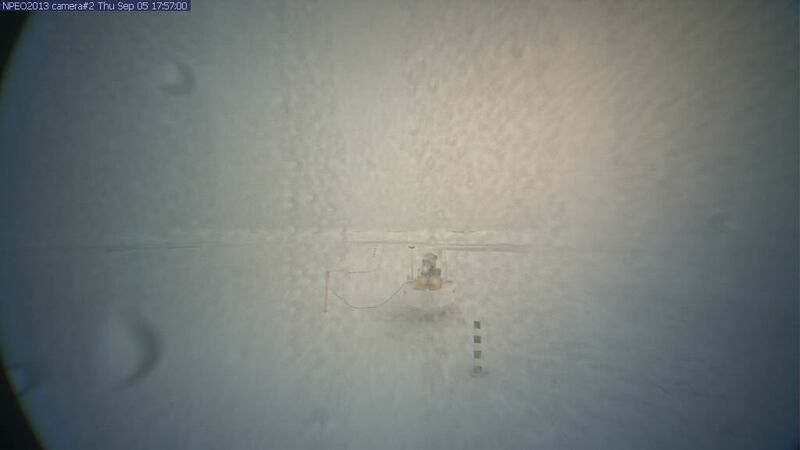 The wind at 1200z is steady at 20 mph, and the temperature is 23 Fahrenheit. (For you Europeans, that’s a wind of 10 m/second, and a temperature of -5 Celsius.) 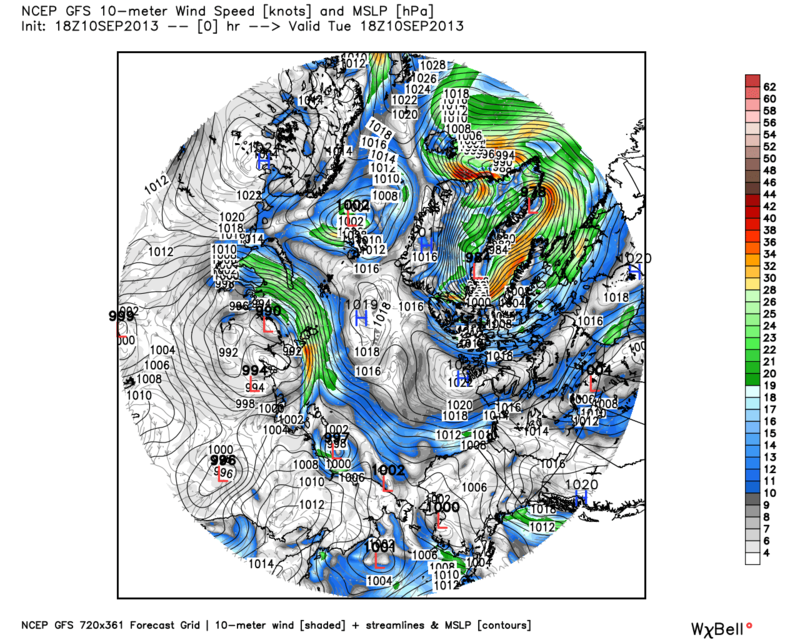 Either side of the Atlantic, it makes for a wind chill few would want to stand about in. 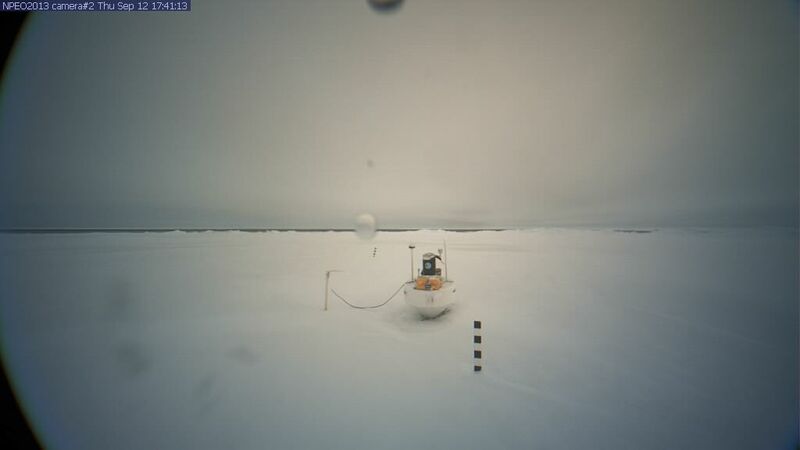 All the snow is blown away, and we see the polished ice of the bottom of “Lake North Pole.” Only a month and a half ago that lake lay shining in the sun, nearly deep enough to float our buoy. Sing with me, “Where has all the water gone? Long time passes. Where has all the water gone? Long time ago.” Actually, you can see it off in that lead in the distance. I think I faintly see ice on the far side, but could be imagining it. I don’t have time to write. Excuse? A sick rabbit at our Farm-Childcare. (Add “rabbit-doctor” to the string of peculiar jobs I’ve done in my life.) Main feature on map is that Newfee is weaker and a secondary low, “Newfeeson,” is forecast to blow up over Iceland and move more towards Scotland than the Pole. 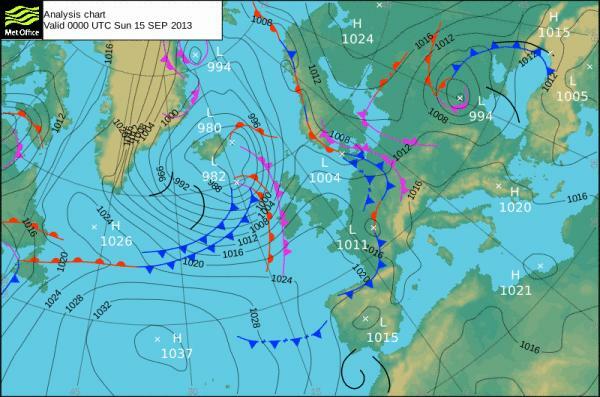 Gloomy Sunday shaping up, across the pond. By Tuesday building high pressure over Greenland could be blowing our camera north again, so if we are going to make any headway south to Fram Strait we’d better do it now. While the zero-degree isotherm has been pushed well north of Svalbard, and the minus-five isotherm has been dented away from the pole, the minus-ten isotherm is becoming more common. 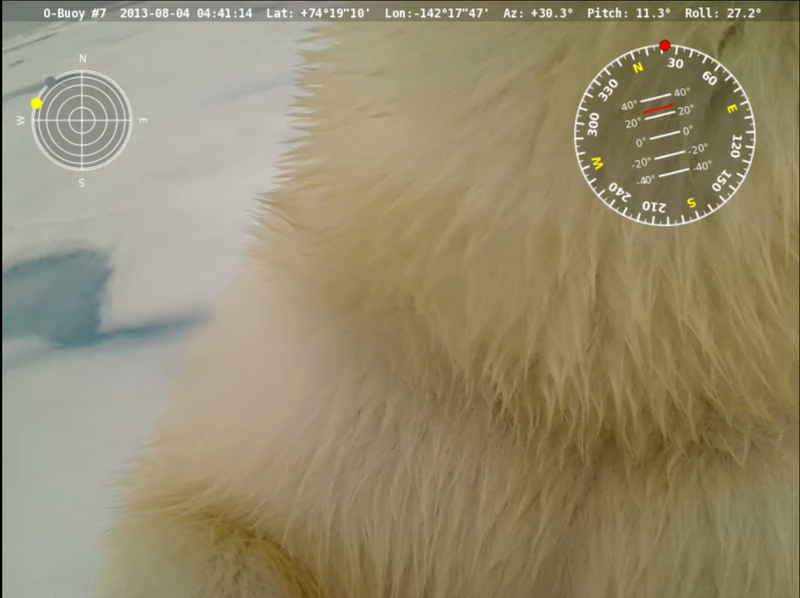 There is a large pool lurking, nestled up against the coast of the Queen Elizabeth Islands, and the spot around out across-the-pole camera is larger. 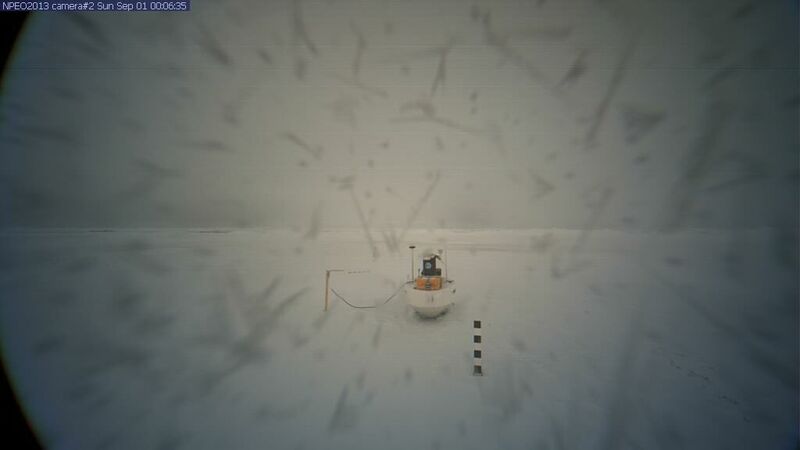 Look at the drifts at the base of the buoy and the snow-stake, and the way the wind leaves “shadows” of snowless ice downwind. 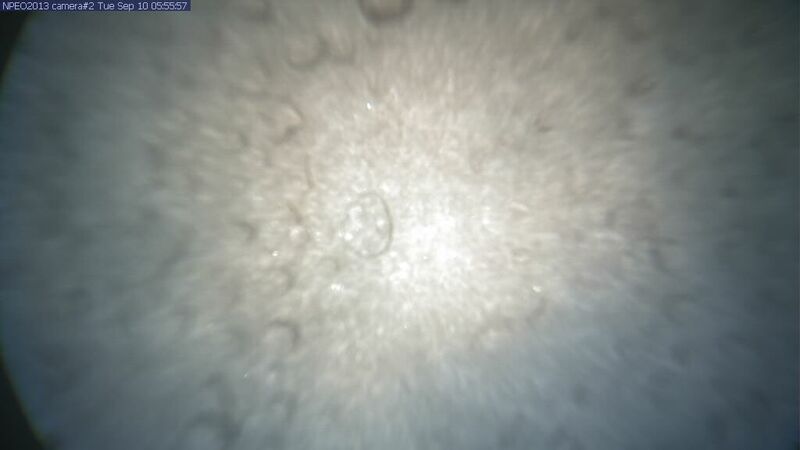 Specks of snow are on the lens, not in the air. Hopefully the lens won’t get covered. 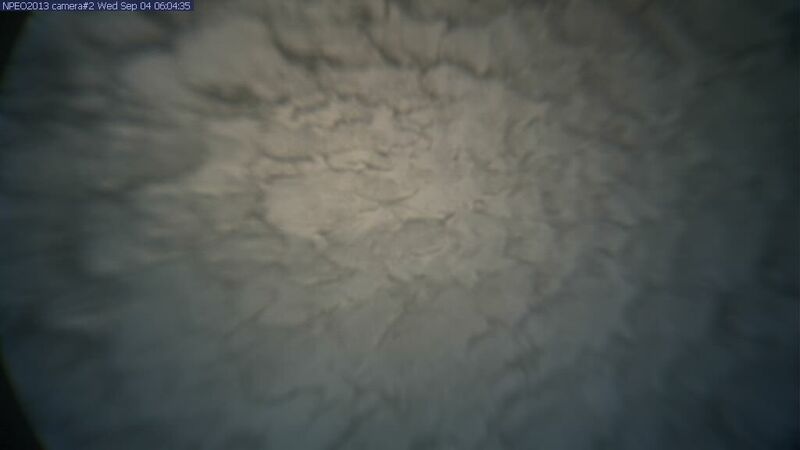 The pictures are ten minutes apart, and the snow on the lens seems a little less on the second picture. Keep your fingers crossed. 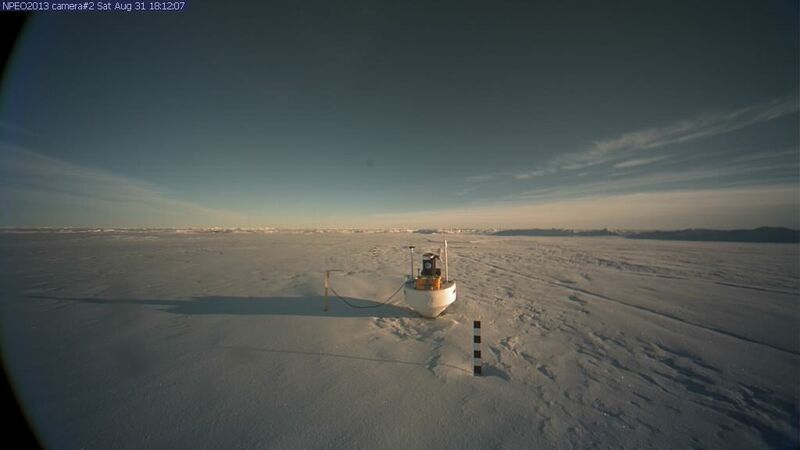 “Army” data has temperature up to -1.42 C, and the position at 83.86 N, 4.67 W.
Seeming it pays to sail south. Temperatures warmed from -4.0°C at 1500z to -0.9°C at 0600z. However the strong winds have faded away to light airs, and perhaps that is letting the cold carch up. (I’m joking.) 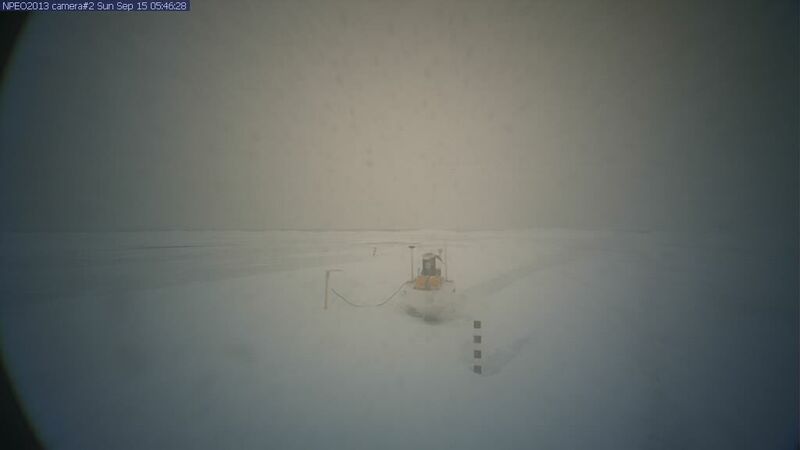 In any case, temperatures dipped back down despite the daylight, to -1.8°C by 1500z. 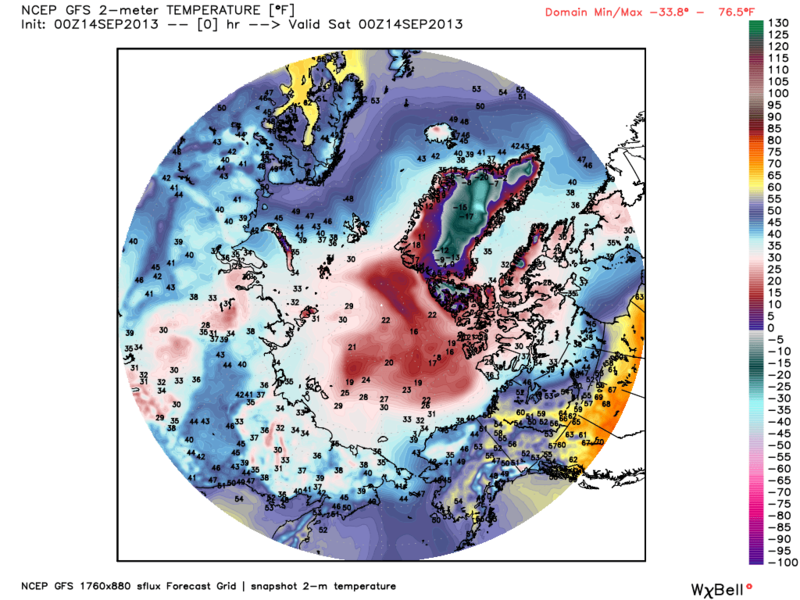 This is still above normal for this far north, this late in the summer. 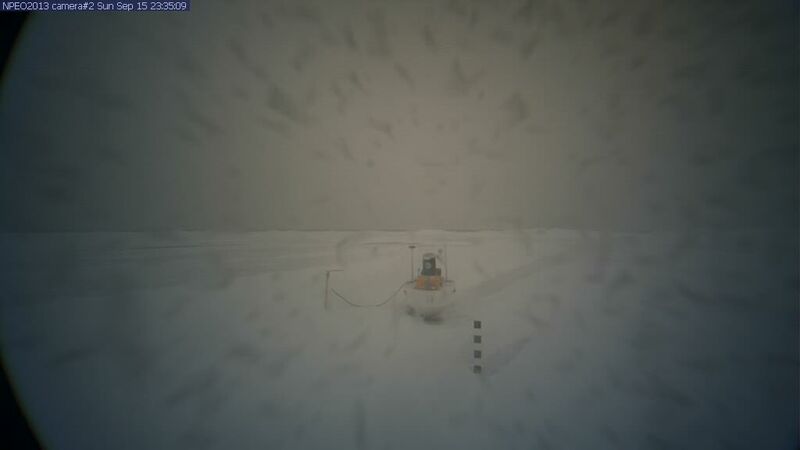 The buoy has headed steadily south 83.963°N at 1500z yesterday to 83.862°N at 1500z today, though the speed of this drift has slowed as the wind has dropped. The drift west has continued, from 3.914°W at 1500z yesterday to 4.681°W at 0600z, and then there was an inexplicable jog back east to 4.665°W at 1200z, followed by a slight motion back west to 4.673°W at 1500z. No wind shift explains this jog back east, though it did occur as the wind dropped. Perhaps the wind hadn’t yet dropped someplace relatively near by, and a different mass of ice rammed our mass of ice with greater momentum. Or cut in line, squeezing in front of ours. (Can ice cut in line?) Who knows? Someday we will have a computer program that uses satellite glimpses to give every berg a number, and charts them individually. Then we will be mystified in a far more precise and detailed manner. 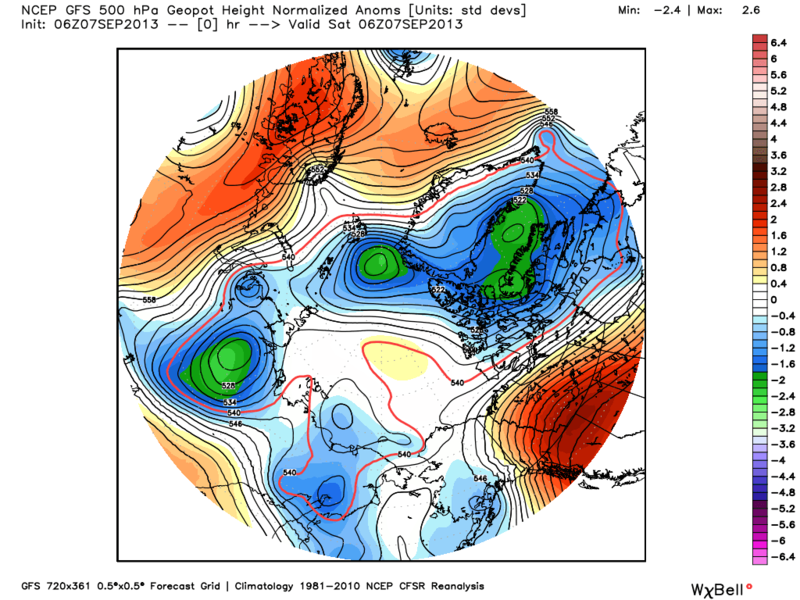 The big boy on the block is Newfeeson, a 962 mb gale who has the good sense not to take on Igor, and instead is heading east to take on Great Briton. Looks like a miserable Monday for those folk. Southern Norway could be worse. Iceland has already had steady winds over 55 knots (63mph) on its southeast coast, so nearly anything tomorrow will be an improvement. 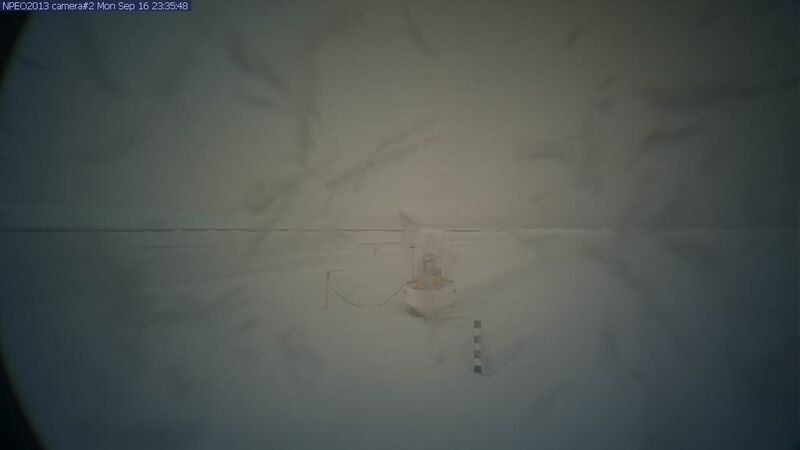 However that is all far away from our camera, where the wind has died and Newfee has weakened to a 1008 mb hint of low pressure just northwest of Svalbard. Just northeast of Svalbard pressures are a bit lower, 1006 mb, and, if you want to push your luck, you could call that a secondary low. I’ll just call it a blurb and part of Newfee, and say he is “reforming” or “translating” east, for I’m not in the mood to name new storms. It almost is as if Newfee coming north was like a wave coming up a beach, and now the undertow has dragged a lot of that energy back down the beach into Newfeeson. (If I was going to name the 1008 mb and 1006 mb lows I suppose I’d name them “Flotsam” and “Jetsam.”) As weak as they are, they represent mild air, and there could be decent uplift, especially with such cold air to the north to slide underneath. They may form a small storm. The build-up of cold under Igor is impressive. The two areas of minus 10 isotherms are much larger than this morning’s maps. It shows you sunshine has little effect, when the sun is so low, and clear skies can allow radiational cooling in broad daylight. Because actual night, or at least twilight, has now progressed north of 80 degrees latitude, for at least a few hours a day, the times of extreme radiational cooling are increasing, on white sea-ice under clear skies. 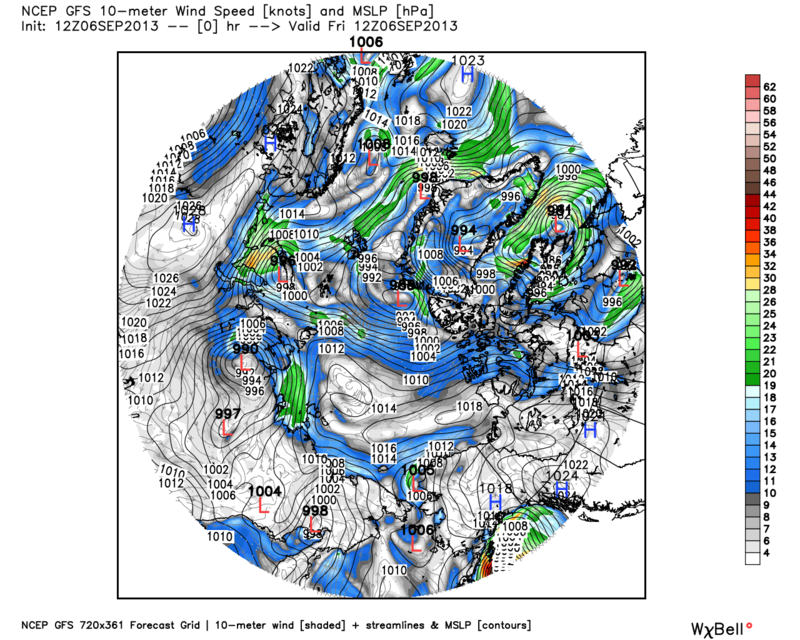 The little storm “Coaster” has rippled along the arctic coast of Alaska to the Canadian coast. 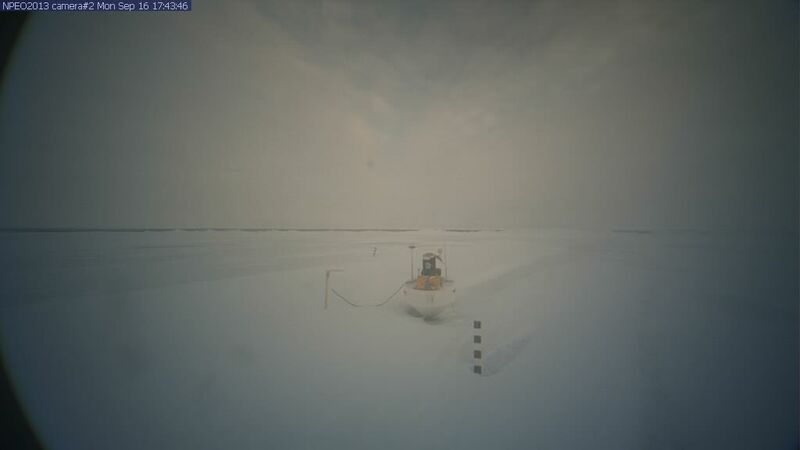 Ahead of it south winds bring a bit of mercy, but behind it the north winds draw Igor’s cold south, hastening the freeze-up of open parts of the Beaufort Sea. 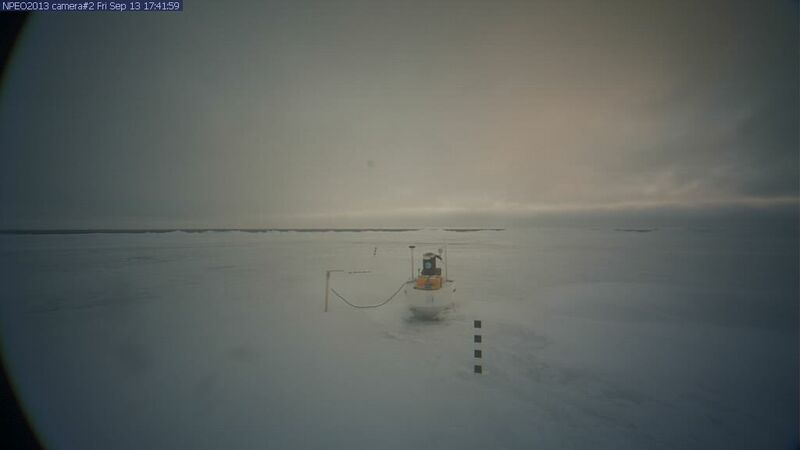 “Hudtwo” has crossed Hudson Bay, and is at the very edge of our map. He is of interest to me because his west side is pumping an outbreak of arctic air down my way. I wish the arctic would pay attention to freezing the Arctic Sea more, and pay less attention to trying to freeze my garden. I figured I’d use a catchy headline to get your attention. (It’s sort of like standing on a table at a restaurant.) In actual fact, with warm air invading from the warm side of the pole, the melt may continue on that side, as the DMI graph of temperatures-north-of-80-degrees-latitude shows an uptick. We have the Siberia-to-Canada cross polar flow we saw earlier in the summer, and it is interesting to see how much colder the air is. A month ago it would include above-freezing air, while now it largely involves sub-freezing and minus-five and even minus ten isotherms. Back then Siberia was still a summer-baked landscape with swarms of mosquitoes, but now it is freezing up, and satellite views shows parts are snow-dusted. 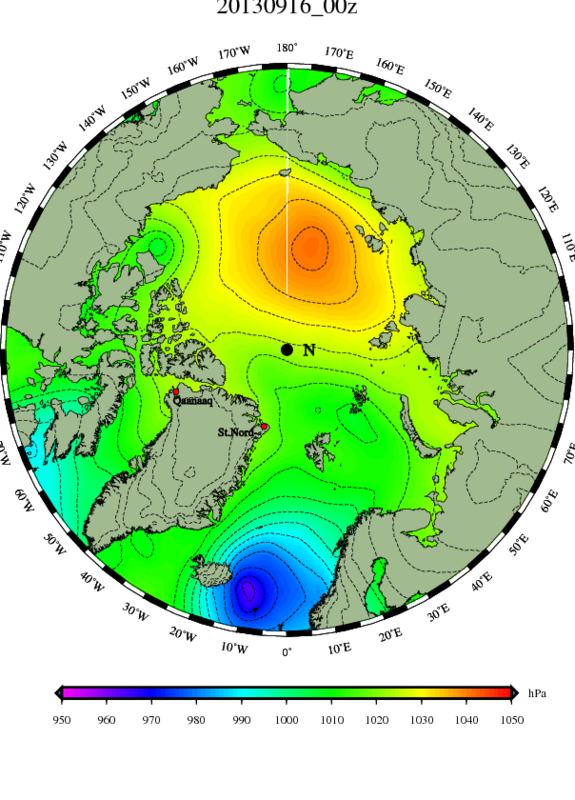 It is becoming a completely different “source region.” Baffee is redeveloping northwest of Svalbard, but is cut off from much Atlantic air due to Baffeeson hogging it all. It is swirling cold and very cold air. 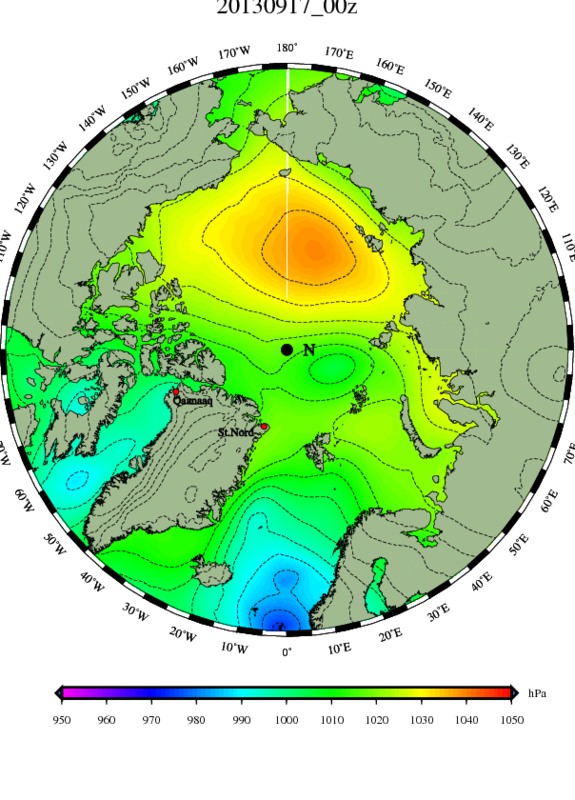 The high pressure Igor looks like he is fed up and going home to East Siberia, where he started weeks ago, however is still strong and cold. Hudtwo has entered Baffin Bay, but looks like he will get sucked into the circulation of Baffeeson and rip straight across the Atlantic to England, and not come north to bother us. 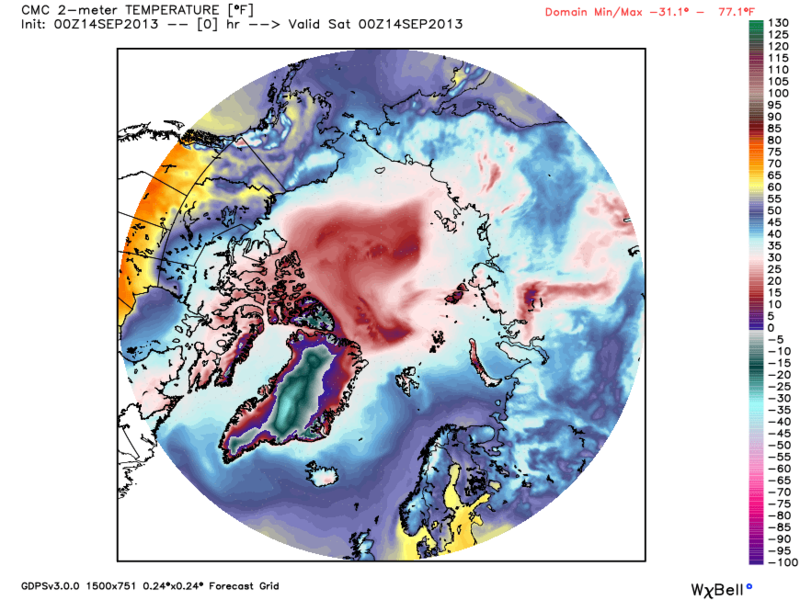 Coaster is an interesting little feature on the Canadian arctic coast, but is running out of warm air to fuel it. It is sucking very cold air in behind and very cold air lies ahead. It likely will fade away into an impulse. 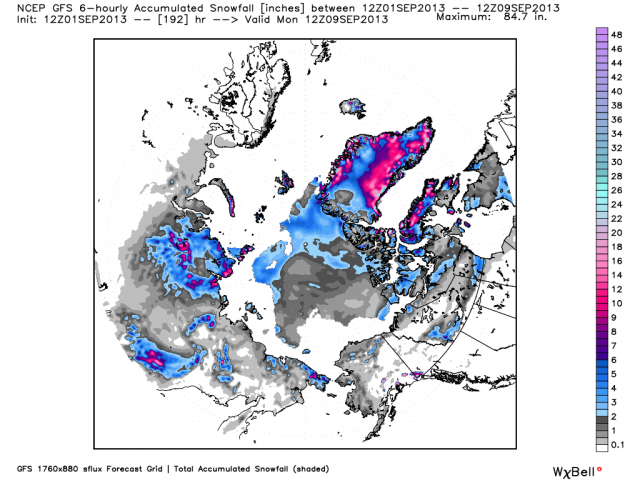 It will be interesting to see how the arctic handles Baffee’s injection of moisture. 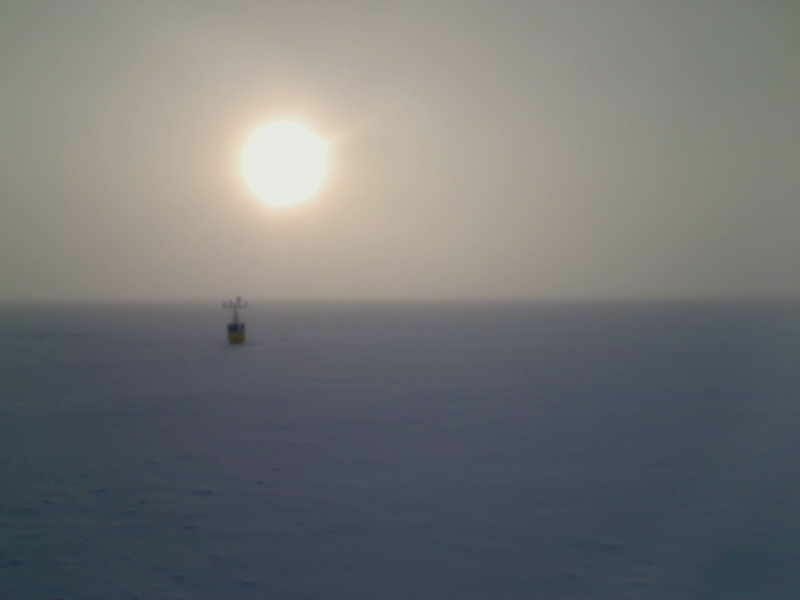 Even under Igor (where you see the minus ten isotherms swirling) at Buoy 2013H: across the pole, with temperatures a toasty -13.35 C, where there was beautiful sunshine for days, there now is fog. I have a very busy week ahead. Lots of maintenance to do at the farm-Childcare before winter sets in. I’ll try to post maps, but commentary may dwindle. 1200Z POSITION: 83.758°N 4.500°W , which means we have finally drifted farther south than we were on August 13. Wind has picked up, roughly north at 10mph. 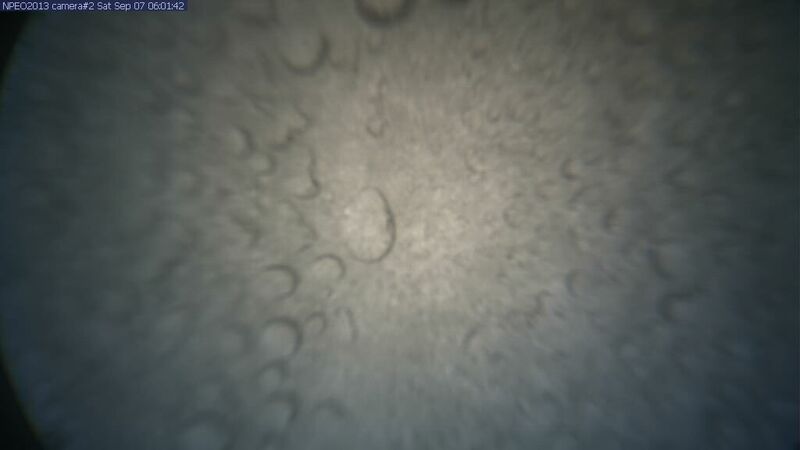 Temperature has dropped to -3.2°C. The buoy has started drifting back east. Hmm. Have a meeting to go to. 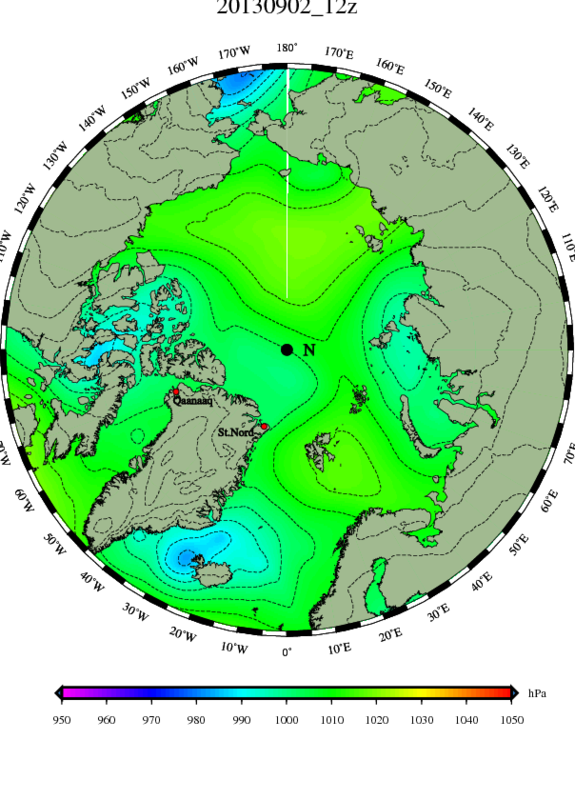 Good discussion over at http://wattsupwiththat.com/2013/09/16/sea-ice-news-volume-4-number-5-no-ice-free-arctic-this-year-it-appears-that-arctic-sea-ice-has-turned-the-corner/#more-93889 Hope to comment further after meeting. As is too often the case, the meeting last night went on and on and on. Hopefully I’ll have time to catch up during a mid-morning coffee break. 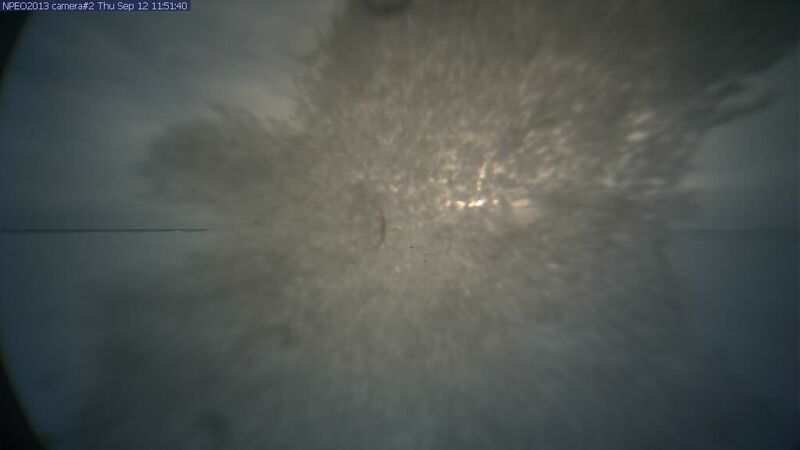 Current “Army” data has temperatures down to -7.34 C. The camera has drifted down to a position of 83.70 N, 4.33 W. Here are the last three pictures from our camera, as the temperatures drop and frost grows on the lens. Temperatures fell slowly from -1.2°C at 1800z on Sunday to -3.5°C at 1800z yesterday, and then plunged to -10.8°C at 0300z today, whereupon the wind died to a calm, and temperatures have risen with the sun to -6.7°C at 1500z today. The buoy progressed steadily south until the wind died, from 83.839°N at 1500z Sunday to 83.710°N at 0000z. Interestingly it continued south after the wind died, but more and more slowly, as if carried by momentum but slowing to a halt at 83.702°N at 0900z. Since then it has drifted back north, to 83.708°N at 1500z. 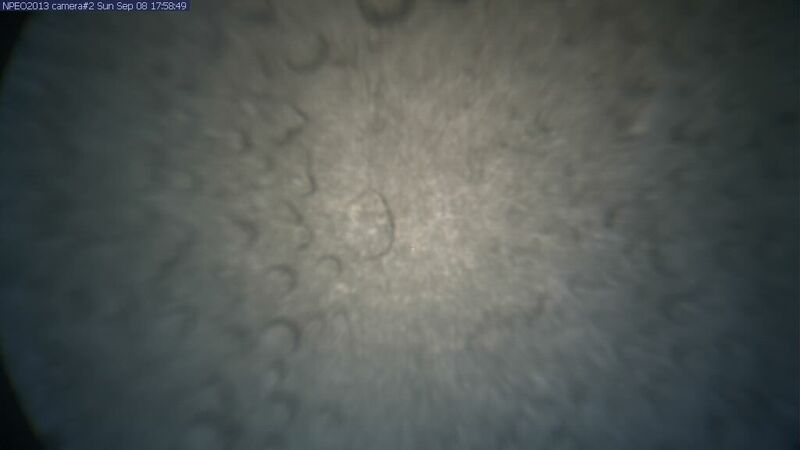 Longitudinal motion continued east, from 4.673°W at 1500z Sunday to 4.274°W at 1200z today, but the finally report has the camera moving west again, back to 4.302°W. This makes the third time I have observed that, when the wind has become calm, the buoy has drifted northwest. Can it be the Transpolar Drift is moving the wrong way this year? 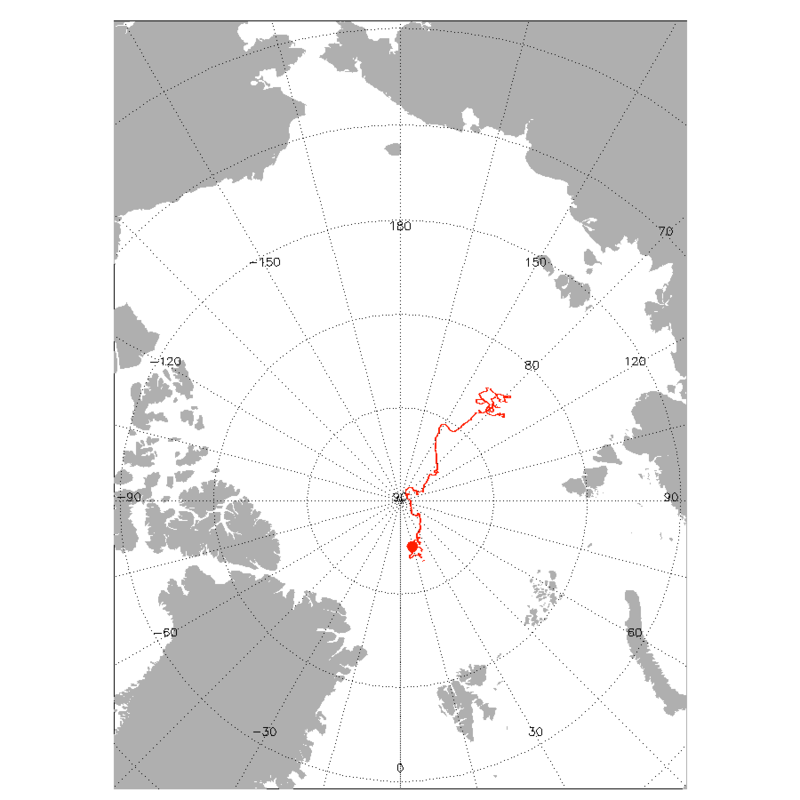 Or is the Transpolar Drift a wind-driven phenomenon, and the currents under the ice are independent? 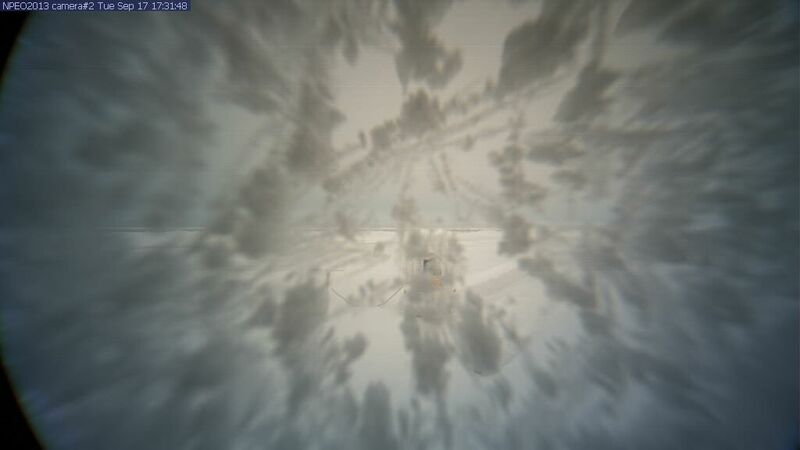 I don’t know what happened to the 1200z picture. Out to lunch again? 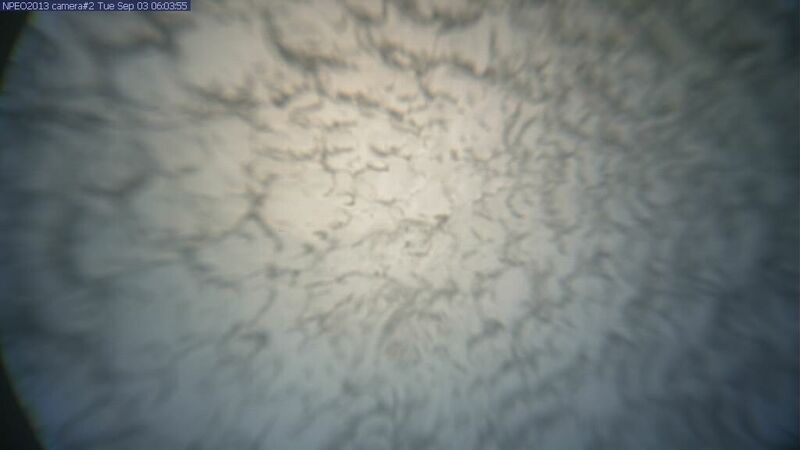 The 1800z picture shows, if you squint through the frost, that the lead in the distance clearly shows a far bank. 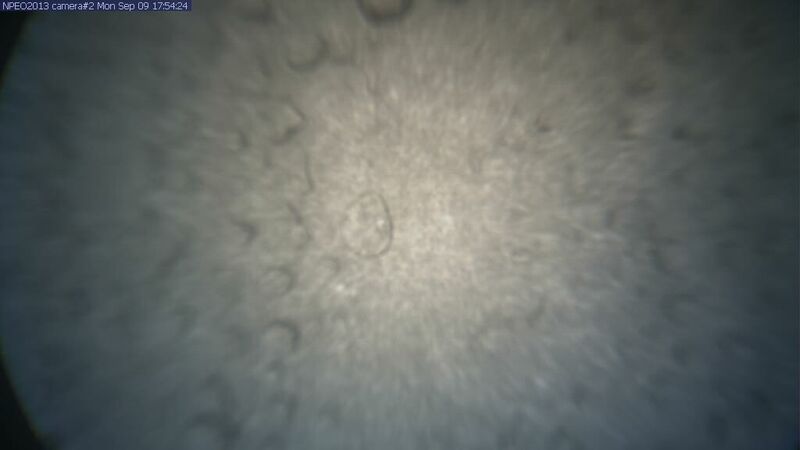 From the low point the camera views from, that means the lead is fairly narrow. I have seemed to notice the lead is narrow more when the camera is southboaund than northbound. 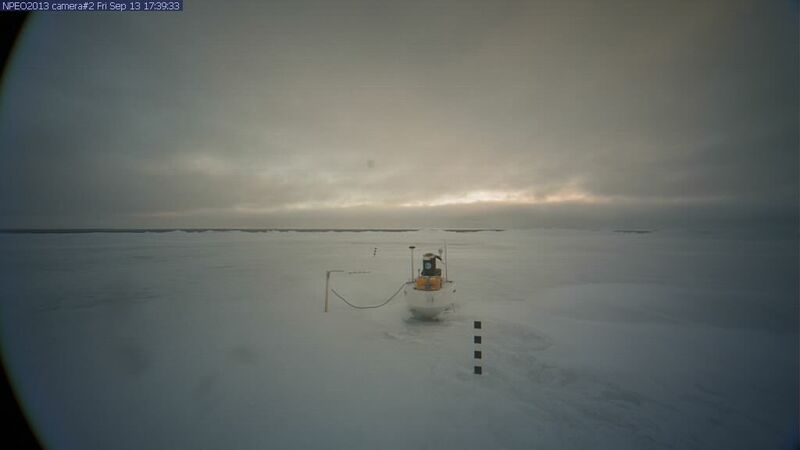 The latest “Army” data shows temperatures again dropping, to -8.87 C. The buoy is again drifting south, to 83.69 N, 4.28 W.
I am better than many at admitting mistakes, but I can’t claim to prefer being wrong. To top it off, I was wrong about a couple of other things today, and it makes a bit of an amusing sidetrack to confess them as well. First, we had a frost this morning, which I didn’t think would happen. Added to a late frost last May, this is one of the shortest frost-free growing seasons I can remember. (Usually we get our first frost around September 25.) True, it didn’t kill my peppers in May and didn’t kill them last night, but my squash plants are history. However it did make me gripe, privately in my truck, as I drove to get grain for my goats, that if the damn air had stayed up in the arctic doing what it should do, which is to freeze sea ice, I might have been right about the sea ice and might have been right about my squashes. Second, I have an old, tiny pickup truck with bad brakes, but figured I need not fix the brakes until after I got the grain. There was a leak in a rear brake line, but I figured if I dumped in some extra brake fluid I could pump the brakes and things would be OK. However the pressure of pumping the brakes blew a front brake line, and then I had hundreds of pounds of grain in the rear, and a tall range of hills to climb and then descend from, and no brakes at all. For the third time in a single day I was being confronted with how wrong I can be. Wimpy guys pull over in such situations, and call their Moms. However my sweet mother died fifteen years ago, so I had to drive nearly twenty miles with no way to really stop. For an old coot like me, it was an absolute blast! Talk about pulse-pounding excitement! Best was when a big road-bully in a lumber truck full of tree-trunks pulled out in front of me as I came screaming down a steep hill with my emergency flashers blinking, in third gear. My tires screeched as I down-shifted to second, and screeched again as I downshifted to first, and I could see a hint of concern in the bully’s face, in his side mirror, as I swung out to pass him and saw the on-coming dump truck. As I swung back and considered the breakdown lane, I could hear the road-bully was shifting up through sixteen gears with remarkable haste. Not that my tiny truck represented a threat, but it would be a bother for him if I went under his chassis and I got smushed. After I got a good view of his licence plate, around the level of my rear view mirror, he pulled away. In this map they don’t bother attempting to measure the extent of the extent. They don’t try to measure the difference between solid 100% ice and mostly-water 15% ice. 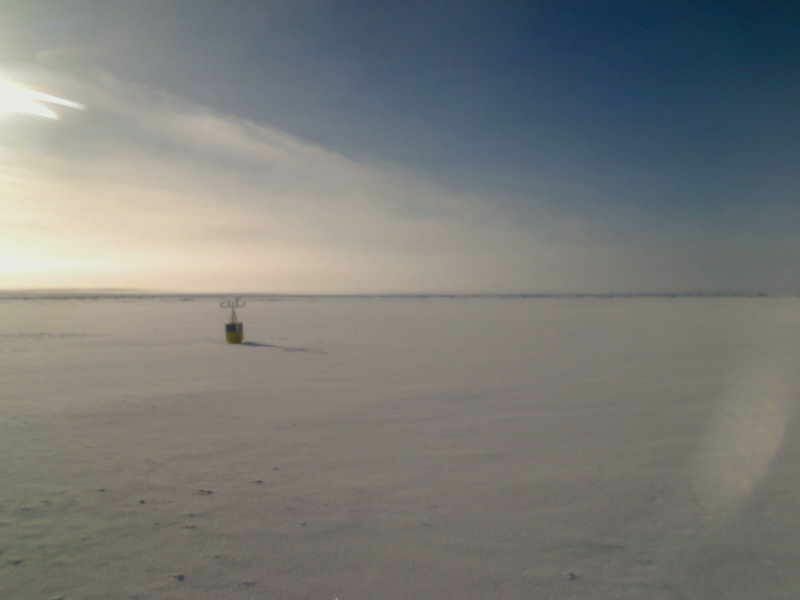 They just measure the outer edge of the sea-ice. Extent is extent, and that is that. 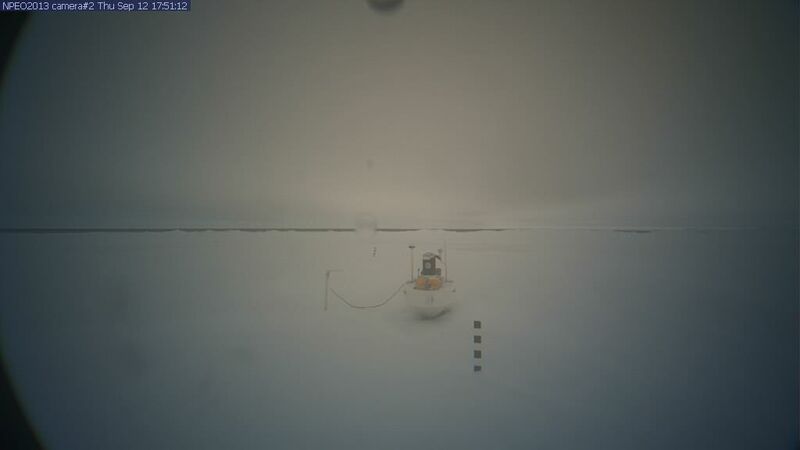 Due to my observations from my microcosm of a camera, I know the ice has not moved down towards Fram Strait, and instead has been wrong-way ice. moving toward the Beaufort Gyre. Therefore it makes perfect sense to me that one of the few places the ice extends outside the “norm” is at the Canadian edge of that Beaufort Gyre. It may seem to make no sense for the only other place ice extends to to the edge of the “norm” is west of Svalbard, smack dab in Fram Strait. 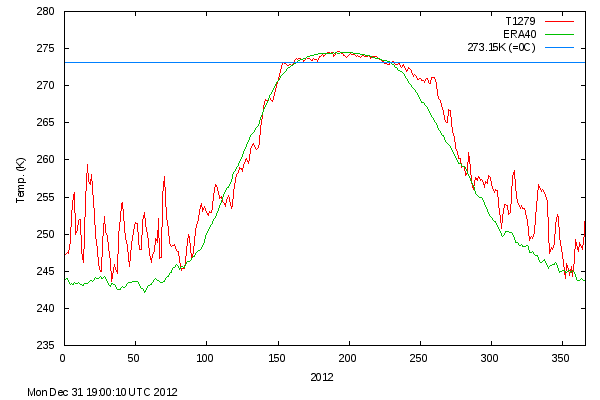 In fact last week the ice actually extended over the orange line. 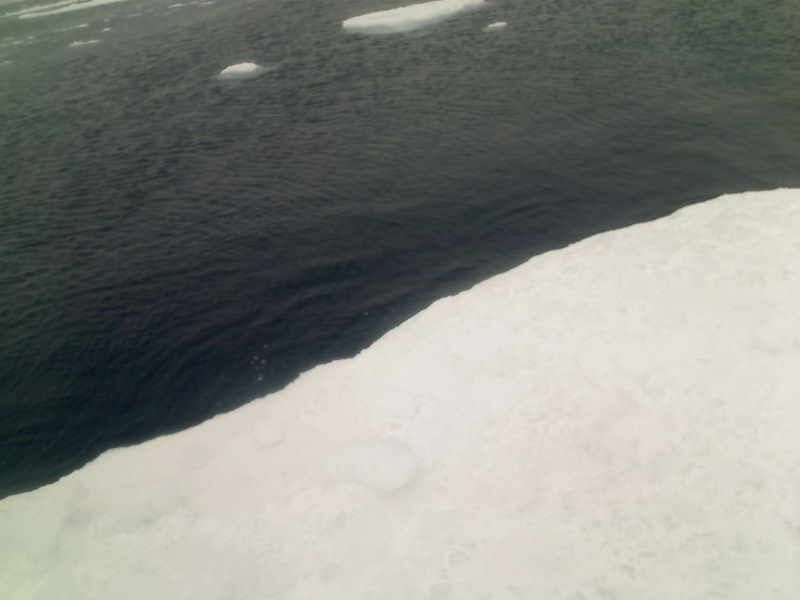 How can that be, considering the ice our camera sits on hasn’t headed down there to add to the Fram Strait edge? Well, that ice just happens to be the only ice behaving the way I expected. What did I expect? I expected that water to be colder, and form sea ice quicker. Why? In a nut shell, water with any sort of ice on top grows new ice at the surface, as soon as temperatures drop below the freezing point of salt water. 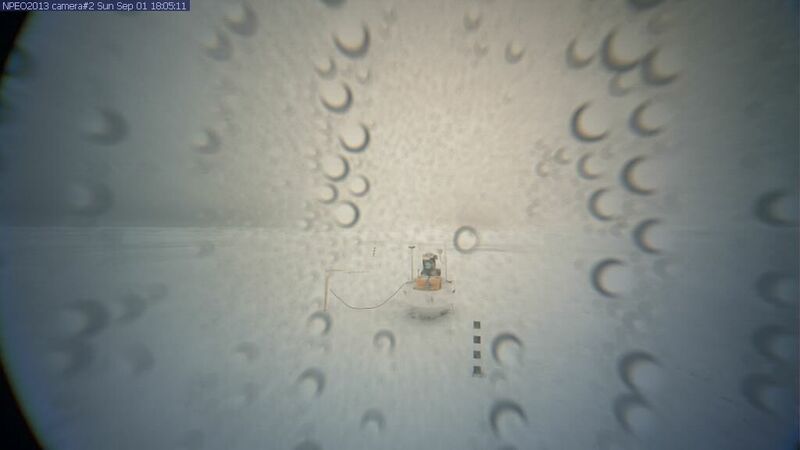 The floating ice, even if it is small as a falling snowflakes, forms seed crystals for expanding ice-cover at the surface. 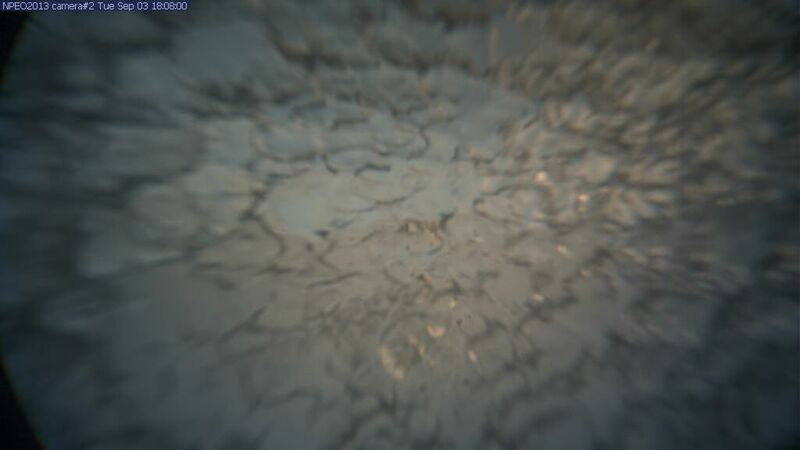 However, without those seed crystals, open water does not freeze. The cold water sinks, and is replaced by warmer water that rises up. (This is different from fresh water lakes, for any fresh water below 36 degrees Fahrenheit rises just like ice rises, whereas if you add salt the same water sinks.) In other words, open stretches of arctic water would need to chill to near the freezing point of salt water clear down to the bottom, were it not for the existence of the pycnocline, 300-450 feet down, which means the water only needs to chill around a ninth of a mile down before the top freezes. In other words, without any ice cover, water gets colder much more deeply. There was so much area without ice, as last winter set in, I figured much more water was chilled much more deeply. It made perfect sense to me temperatures were colder up towards the pole last summer, for even if a storm stirred up water from the deeps, the waters were colder. However this influence only occurred when you were talking about temperatures a degree above freezing, in July. As soon as temperatures dipped lower than that, the water wasn’t “colder,” but was relatively “warmer.” And that sent my theory down in flames. Now, although arctic air temperatures were below normal last summer, we are still seeing a vast area of water north of the Eurasian coast remain ice-free. Even if this water is slightly colder than last year, it is behaving as last year’s did, and the water down to 300-450 feet is getting colder and colder, like it did last year. Because of this vast area of deeply chilled water, I imagine the warm AMO can no longer send currents north under ice, to melt the ice from beneath, for the ice is gone. 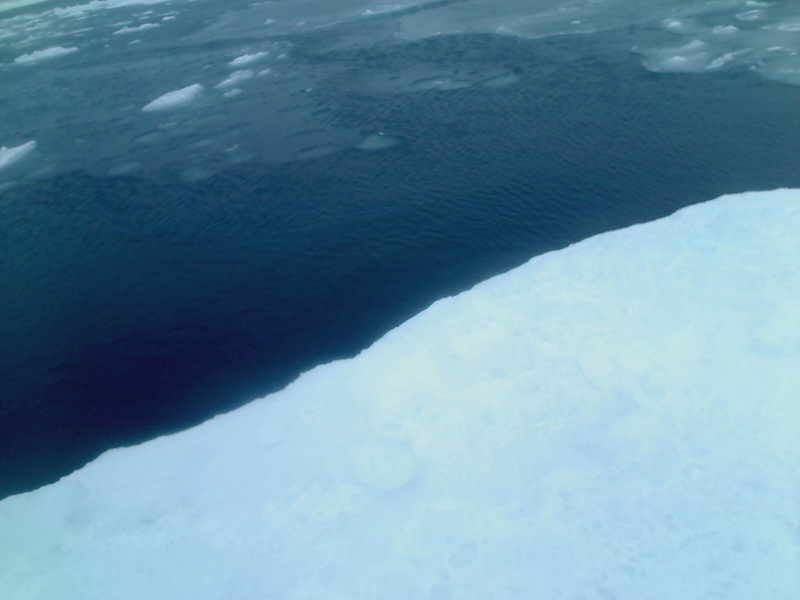 Instead such currents are forced up over the cold water, and then are chilled by both cold water below and cold air above. By melting the ice that once protected it, the AMO has become, I imagine, an instrument of its own demise. 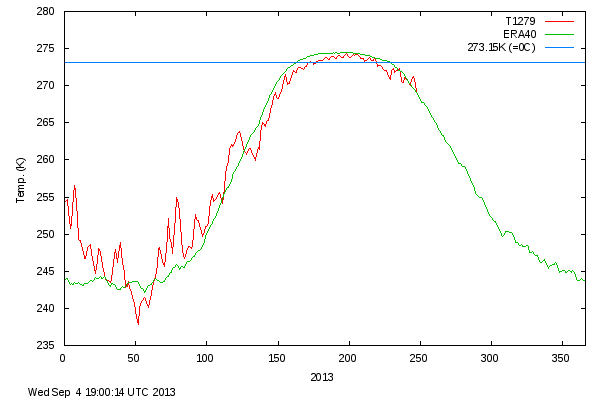 And I think that is what we are witnessing: The demise of a warm AMO. In terms of how we see now, we are virgins about to lose our virginity. Before we lose our virginity we are naive, and have erroneous expectations. However we discover it can be fun to be wrong. Not that it solves our problems. It can make problems much more complex. However to have a know-it-all attitude is absurd, and can lead one into a state of mind where they, in effect, never lose their virginity, yet still think they know-it-all. I am definitely long past that. I confess shortcomings, but virginity is no longer one of them. 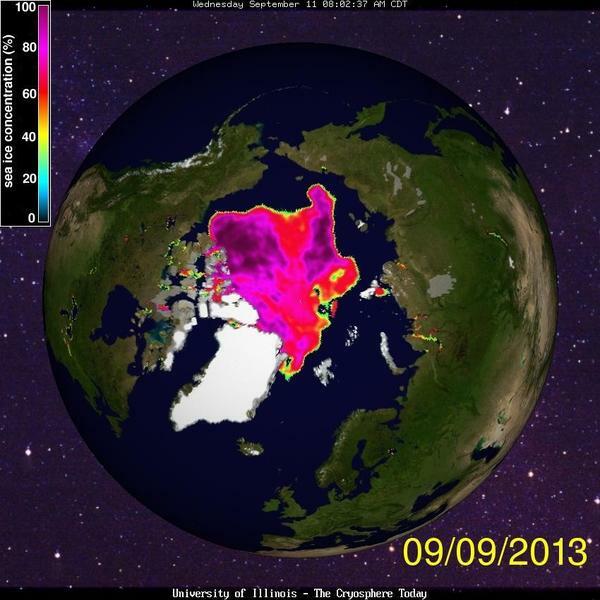 This entry was posted in Arctic Sea Ice by Caleb. Bookmark the permalink. Thank you so much for providing your fans with a ’round two’ !! Ps does hitting the adverts on your site provide you with income ? I know it does on other weather sites which i like because it enables me to contribute in a small way to the costs of the site and to the time spent providing the information . If it doesnt i can skip this chore , if it does i can hit the adverts for all they are worth !!! No advertisements appear on my screen as I post. I’m surprised they appear on yours. I receive no income for posting. No one asks me if they can advertise on my site. However it is a “free” site, and considering I pay nothing, I suppose WordPress must make some money someplace. I may upgrade to a “professional” site, in which case perhaps I get to say who is allowed to advertise. Or maybe not. I’m glad you enjoy my reflections. Hopefully we see some interesting things before it gets too dark to see. Anthony, it’s actually at least round 4. Thanks for getting me in touch with so many people, Eric. It is nice to have an unpaid agent. Lol on that. I’ve just given a few links when it seemed helpful and on topic. But it is interesting to see what just a few links can do, especially when you have something to offer that interests people. You have a flair for the dramatic, so as this global warming edifice crumbles, you can be on the front line reporting! Yes, it is interesting. Also a bit stunning, when I came home, clicked on my computer, and saw my obscure site had over a 100 hits in an hour. Then it was fun to play detective and trace it all back to your single comment at WUWT. Back before WUWT existed the best site for arguing was, believe it or not, Accuweather, which now has turned into an echo-chamber. Back then there really wasn’t any moderation at all, and it was a sort of constant barroom brawl. That was where I learned to take a punch, stand corrected, and have a sense of humor rather than getting mad. I think more and more are catching on now, and you may be right: The edifice may be crumbling. It will be interesting to watch and see how things play out. I likely will fail to keep my big mouth shut, as it happens. Silence has never been one of my strong points. The comment you made over at Goddard’s site generated over sixty “views,” in around 3-4 hours. So you must have a knack for making people curious. I only hope I am worth the trip. I may soon be out of a job as well. 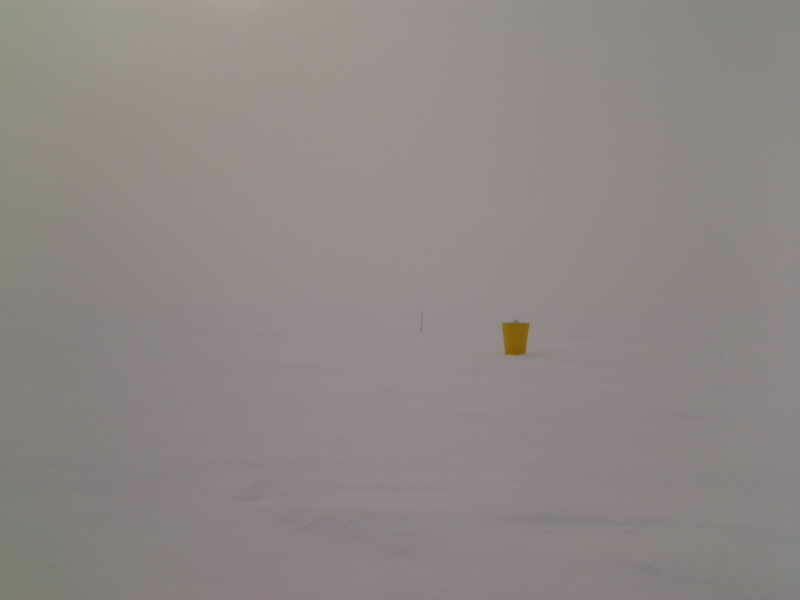 It gets pretty dark up at the “North Pole Camera” after the equinox, and even if the buoy gets frozen up there all winter and never gets down to Fram Strait, I doubt my antics can attract many “views,” when the view from the camera is of a black rectangle, four times a day. It is serious because “arctic sea ice” was the last, great hope of something which increasingly looks like an almighty fraud. With the fraud exposed, things get different. Rather than talking about the weather, we may have to talk about more serious things. Hopefully I will figure out a way to use my sense of humor, when people get serious. Whew, a long way up to get to where I could hit reply. Hopefully this falls in the right replace. As far as what’s next, in terms of agw, trying scrolling through TomNelson. You probably will see things that spark ideas. Thank you the terrific blog, I just found your link a week ago and have been checking back for updates and going back in time as well to see this summers chill. I must tell you and anyone reading comments how surprised I was to see warmers trying to twist the ice build up this year and the cold summer as proof that the arctic is still in crisis. 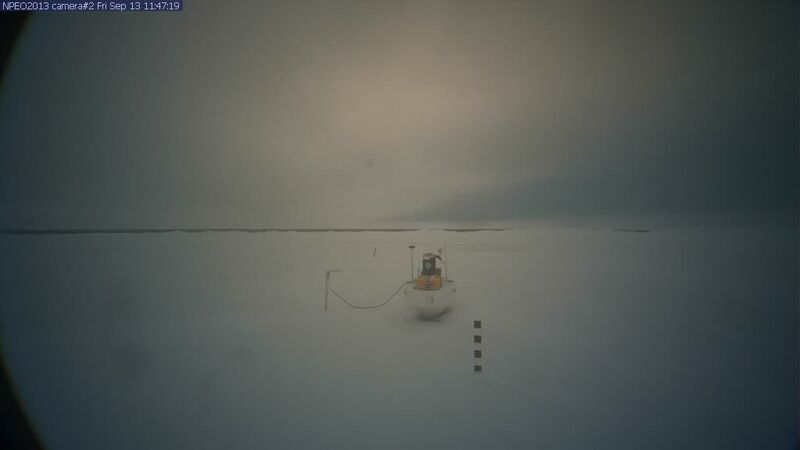 I saw in your blog about this, but I was not expecting to see actually see it coming from “official” channels, as to make it sound serious instead of good that the ice has recovered, I guess “weather” ruined their party. however I’m fairly sure that eventually long term climate trends will prove them wrong, but we obviously will have to wait multiple years before this Religion gets debunked. Can’t have little things like facts getting in the way. If you look back a couple posts on my site you’ll find a link to a post on WUWT about re-discovered old maps of summer ice cover, and a period of low ice just below World War Two. The “recovery” of sea-ice from those low minimums was surprisingly rapid. I would not be surprised to see a “recovery” from current low summer levels that was equally rapid. Within a few years we could have far more multi-year-ice. Thanks for your kind words. I’d likely watch the ice melt even if no one joined me, but it is always nice to share an enjoyment with others. Thanks for that link. I don’t have the time at the moment to study ice-chart history to my heart’s content. To be honest, my knowledge is spotty, and people are always filling in gaps. I would like to add my thanks to for providing all this interesting information and comment, which I find delightful, not one sided, but dismissive of the rubbish that is put out there by some, You are a seeker of the truth, and obviously a fellow skeptic but one like me who believes in the true data, and I don’t mean models, If the true data says the arctic is ice free I will believe it, but we all know that is not going to happen anytime soon, why, because the data says it is not happening. Keep up the good work, do you intend to continue putting out information and comment as the darkness descends, I hope so. We have quite enough trouble trying to see truth, and weather is a wonderful humbler of the human ego, showing us how we get things wrong. Why anyone would want to make life more difficult by falsifying data is beyond me. I suppose some think it is a way to easy grant money, or some such thing, however in the end “easy” money creates “difficulties” you’d never be bothered by, if you simply had stuck with honesty. 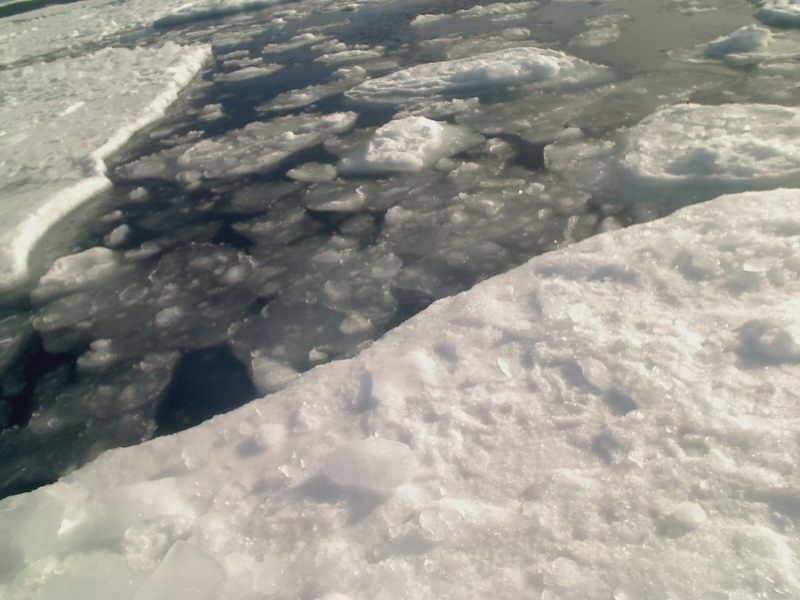 I am really enjoying watching the ice melt this year, and likely will continue my comments until the dark descends. Thanks for the encouraging comment. 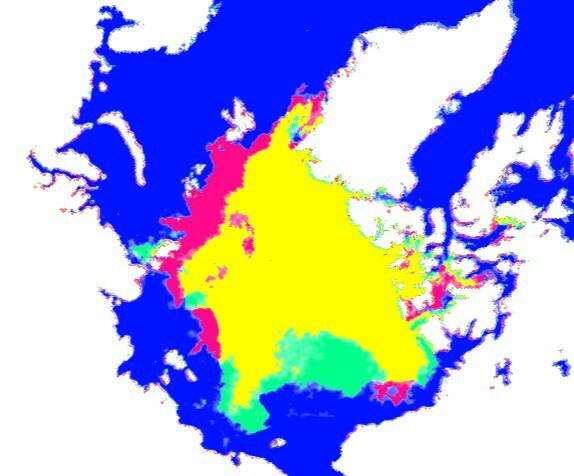 Just confirming that I’m a repeat visitor over the last week and a half or so, the sea ice maps are something I always like to watch, so I got a kick out of your analysis, very interesting stuff, and educational to boot, as a teacher I enjoy having a bit of character presented with the data, as it is something I try to do myself, keep up the good work. Teaching is a great thing to do, but if you have a student like I was, you have my sympathies. Hah, I was an awful student myself, too damn smart for my own good. One of these days I gotta go look up a lot of teachers and apologize… anyway, you mentioned not seeing what happened with the dmi pressure map which got me thinking: http://i341.photobucket.com/albums/o396/maxarutaru/output_H2tEAE_zps32e36ae5.gif made it on gifmaker, just the first google result that came up but it worked fine. Would have done it on GIMP but I’m stuck on windows at the moment until the linux gamepad-mouse program I use is updated and fixes the bug it’s having that makes my mouse cursor run to the left constantly, and as such have been too lazy to redownload GIMP because windows makes me feel anti-creative and irritable. Clicking on your link got me a picture switching between two DMI maps, which I liked, for if there is anything I like better than a map it several maps creating a sort of animation. However I prefer pictures of reality. One problem I run into is that parts of some maps of current-reality are partly observations, and partly filled-in-by-model guess-work, for the areas between the actual observations. Sometimes such guess-work is wrong, and you get some storm blowing up between two observation-points, yet the guess-work doesn’t envision such a possibility even occurring. One thunderstorm can then be the proverbial butterfly-flapping-its-wings, which knocks everything out of kilter. Even before there were computers, the old-time forecasters were in a sense “modeling” when they connected-the-dots and drew the line of an isobar on a map. They didn’t know for sure the isobar went where they drew it, but it was their best guess. Sometimes they missed the little blip of a thunderstorm, which was that butterfly-flapping-its-wings. The next day they would see a new feature on the next map, and shake their heads, because they didn’t expect it to be there. l just spent a good time just watching those maps play, over and over. Thanks. 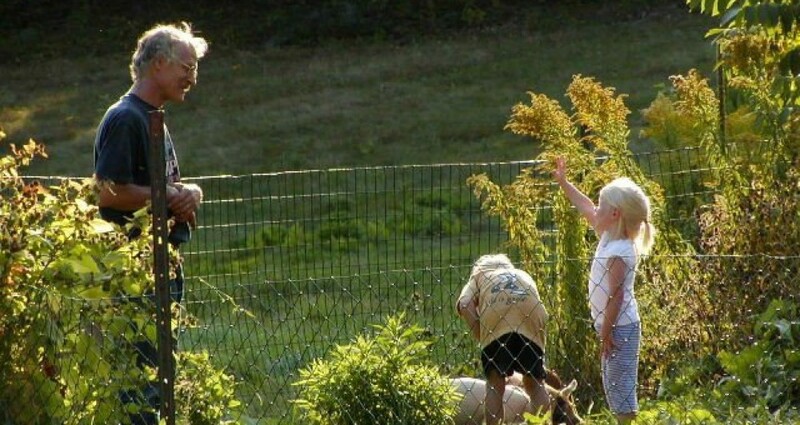 My mind works better with pictures than numbers, for some reason. Very interesting comparison. August 3 would have been just before the big storm last summer. You can see how much the Beaufort Gyre has built up, over the past year, though that cryospehere map doesn’t show that theres a considerable amount of small stuff floating between what it sees as the ice-edge and the coast of Alaska. What puzzles me is why there should be that area of purple over towards Asia. I actually thought it would have flattened out by now. It is dangerous to stick your neck out with a prediction, but great fun. And it always teaches you, when you see things that you didn’t expect. I’m glad you enjoy my blog. At this point I write for the sheer fun of it. At some point I may create a sidebar with links to eBooks, holding stuff I’ve written over the past 50 years, and may try to generate revenue. However that sounds suspiciously like work. Therefore I procrastinate, when it comes to creating eBooks, and simply enjoy myself writing. I’ve had a bit of contact with other bloggers who work very hard to increase their “views” and “likes.” I think that, once you reach a certain level, you attract advertisers and actually can generate some ad revenue. However they work so hard getting “views” and “likes” they seem to have little time left to produce something worth reading. I try not to get sidetracked by the “popularity” aspect of blogging. That can steer you away from the real fun, which is talking about stuff that interests you, and meeting others interested in the same things. I found your blog through Steve Goddard’s. I didn’t expect to see an abrupt halt to the death spiral for a few more years, but it is always pleasant to watch nature baffle the warmists ahead of schedule. I hope Neven’s health is not negatively affected by all this; he was quite depressed a month or two ago, and as I was banned from his blog, I’m especially concerned he may be suffering from Skeptical Science Syndrome. Anyway, nice blog. And for those getting unwanted popup ads, AdBlock Plus and Adblock Plus Pop-up Addon will fix it. The feeling I get is that the arctic re-grows ice faster than it would seem possible, if the AMO even goes slightly cold, even if it is just for a year. This year it is still “warm,” but much colder than last year. Last year was the third highest, with 1998 being second highest, and 1878 being the highest of all. 2007 was a warm up-spike, as you’d expect. I’m just a happy-go-lucky peacemaker who happened to poke his walking stick into a hornet’s nest. Hello Caleb , just wanted to say you were lucky you had a car to sleep in in your hippy days , i dropped out also but could only find allotment sheds and barns to sleep in ! 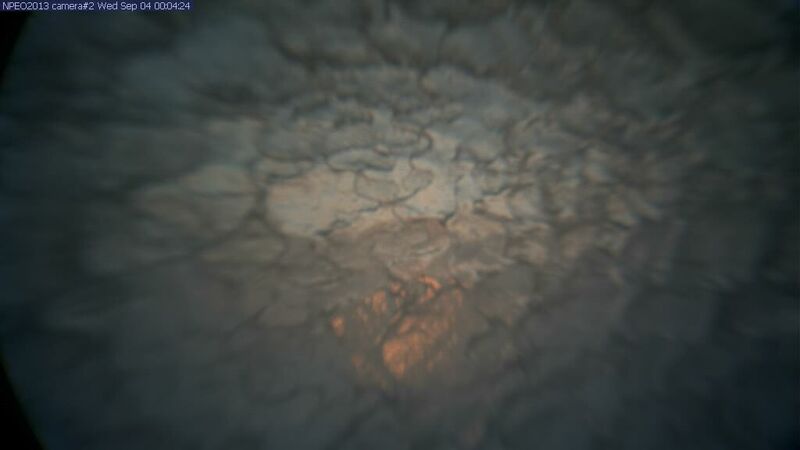 Surprisingly i also managed a petrol / gas station – and worked bronze casting artworks as did you .. Anyhow what i wanted to ask is if there is a thermometer measuring the temperature of the actual ice at the pole ? Months of winter air temperatures of minus freezing to death ought to have stored the cold in the ice sufficiently to immediately freeze rainwater , but it allows pools to form so has the ice lost nearly all its cold and is just teetering on the edge of melting ? I am by no means an authority on this subject, but will answer to the best of my ability. As far as I know, most ice on the Arctic Ocean is simply too thin to really record past temperatures for very long. Of course it will “remember” past chill to some degree, just as a sidewalk will remember a cold night even after sunrise, and a mist of rain will freeze on it even though the air temperatures are above freezing. I think there is some mystery involved, simply because some serious extremes are involved. 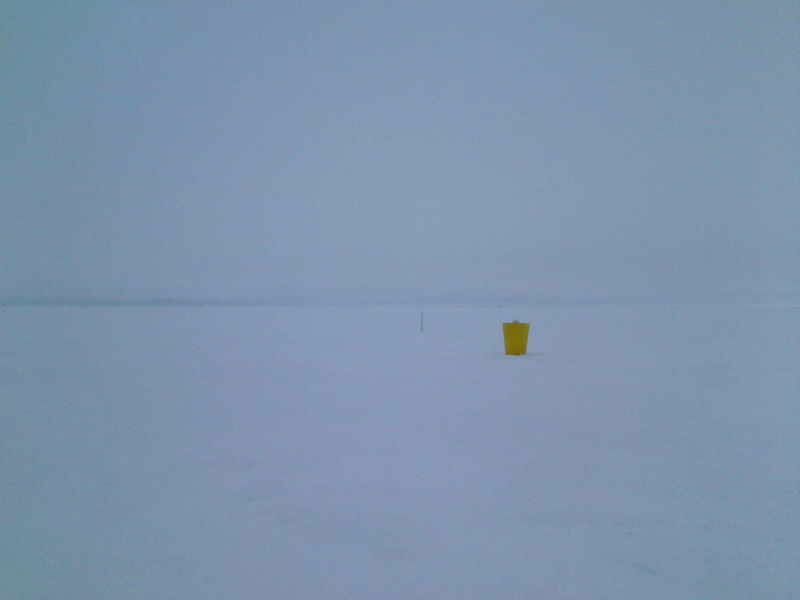 In the dead of winter you can have ice part and a lead of open water form, and then you have air of 40 below Fahrenheit in contact with salt water of 30 above. I’m sure there are scientists who would give their eye teeth to be at the spot with an entire array of thermometers deployed to observe what happens next. I do recall reading that, when the ice is very thick, such as in the icecaps of Greenland and Antarctica, there may be a “memory” of past temperatures in the layers of ice. However the ice in the Arctic Ocean is mostly less than ten feet thick, and is mashed and bashed about in a most irreverent way that violates all laboratory guidelines and standards. My guess would be that, when the salt water below is at 30 Fahrenheit, and the air above is at 32, the ice between is mostly at 31. I agree I was lucky to have that car to sleep in. It was a ’74 Toyota Corolla with a tiny 1200cc engine, and the thing simply would not die. Even when the body finally rusted away after 14 years, the engine was used to run a small, Navajo sawmill. It cost me $2400 brand new in 1974, and was one of the best investments I ever made. (It got 32 miles a gallon.) However it was pretty cramped to sleep in, considering I’m six feet tall. I’m glad you survived your time sleeping in sheds and barns. It is odd how high ideals can lead one to such a plight. However a strong dose of reality is a good thing for any young idealist. You learn which ideals are crap, and which ideals stay with you even when you are sleeping in a shed. Speaking only for myself, the highest ideals never left me, and in fact were burnished by the hard times. I consider myself so lucky to have come across your Blog . i now cannot begin to eat my breakfast without first tuning in to you and seeing what you have to say . I love your innovative style of writing – quite unique and makes other weather pundits seem so boring with their ” only i really know whats really happening” and they never ever admit that they are wrong . Hence the reason why with the British Met Office longer range forecasts they are correct only when you realise that the forecast will be far more likely to be the opposite as to what they have said will happen – yet they sell this very iffy information to the nations decision makers – retail , local councils, industry etc etc who are supposed to take action on it – but continually get caught out and blame it on freak weather caused by climate change !!! . I am very happy you are enjoying my ramblings. I suppose some would say I could be making better use of my time,however I really get a lot of pleasure from trying to figure out what is going on, as I watch ice melt. I think it is a very great advantage to be doing it for pleasure, and in a way I feel sorry for meteorologists who do it for money and have to answer to a boss. They must catch hell all the time, because it is not humanly possible to be exact when dealing with a chaotic system. However one thing I have noticed about good meteorologists is that they tend to have an excellent sense of humor. You need one, when you face being wrong so much. There is only one Boss of the weather, and it sure isn’t us mortals. So often ‘She’ seems to enjoy crushing the egos of people who believe their multi million pound computers would make some sense of Chaos , trouble is , if they say ” we are only guessing” they will get their shiney new computers , taxpayers money and their career prospects taken away from them – thats why they have to keep frightening people with their tales of ever increasing warming . What they havnt realised is by their logic Britain will eventually reach the temperatures of the South of France , 99,9999 % of Britons would give their right arms for that to happen !!!! Something to keep in mind about the air being pumped up and down, the descending air masses convert potential energy into kinetic energy and warm up, how much of course depends on what they’re falling into, what the temperature they started at was, and so forth but yeah thinking three dimensionally is definitely important. I remember when I realized that the pressure maps could be thought of as a slice through an undulating surface and the whole concept of 1000 mb/700 mb/500 mb height maps suddenly clicked for me. Shortly after was when I understood why the tropopause height varies from pole to equator and from day to day with the diurnal pumping going on. A great example of the decending air warming is the Chinook (“snow eater”) of the American west, so warm and dry that feet of snow vanish without even making much of a puddle. That is mild pacific air lifted over the Rocky Mountains, with its water removed to make those peaks white and pretty. What I have trouble figuring out is what happens to air that rises up and then comes back down to the same level. In theory it should be the same temperature, but it loses a lot of latent energy as it rises and vapor turns to water and water turns to ice. That actually adds heat and in some cases helps the uplift. Then it is up by the stratosphere, (low in the arctic,) and some heat is radiated away into space. 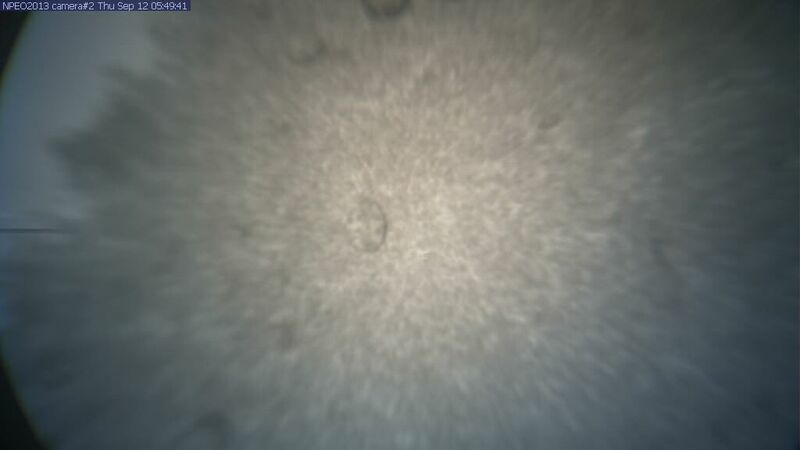 Then the snow falls out of it. 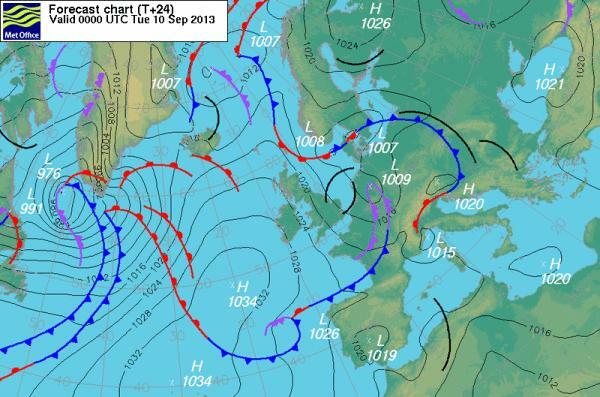 Then, at long last, the air itself comes down in the middle of a high pressure system. After going through this up and down trip, isn’t the air colder? I figure it must be, yet have read of some amazingly hot “down blasts” in the dead of night, after thunderstorms pumped air up in the heat of day. So I know situations must arise (pun) where the uplift doesn’t lead to cooling. Well, I imagine that air lifted from say, the high ice on greenland, raised up near the tropopause, cooled, and dumped down onto the ice over the north pole would end up warmer than it started, as it would have dropped further during the descent and been fairly dry to start with. Air coming from the ocean and carrying moisture up, losing the moisture, then dropping onto a location above sea level should be the other way… but then you gotta toss in the solar heating, what happens when a low pressure system picks air up into sunlight before dropping it, what happens when air warmed by the sun drops into the shadow of the planet, it’s all pretty complicated but fun to explore! Whoops, left out a bit I meant to bring up about the katabatic winds on Antarctica, did a research project for class recently and had to choose an ecosystem, so to be a smartass I went for the McMurdo Dry Valleys, which turned out to be rather fascinating… gotta love a food chain where the top predator is a nematode and there is as much energy brought into the system by chemosynthetic as photosynthetic processes, right? I just spent a bit of time exploring the McMurdo Dry Valleys. Thanks for the link. I discovered another reason that North American “Chinooks” are so dry and warm is because so much latent heat is released as the the moist air rides up from the pacific northwest. You get damp air from a place like Seattle, lift it over ten-thousand feet, and a lot of the vapor condenses, releasing latent heat, and turns to snow, releasing more latent heat. All that snow is left behind, but the latent heat stays with the air as it descends. Therefore it is actually hotter when it gets back to the same altitude. The same thing must happen with air lifted over Greenland, however an interesting difference is the stratosphere is so much lower up near the Pole. My question is: How much latent heat is lost to outer space? It would be interesting to compare the temperature change in air that passes swiftly over Greenland, by a short east-west route, with air that moves more slowly from south to north up the entire spine of the icecap. My preconception would be that a swift transit would find the air warmer, but a slow transit would allow more heat to radiate away, and the air would be colder. I’ve gotten partial to the idea that our eyesight developed along with our skill at throwing stuff further and further. It’s surprising how quickly your brain adapts to something like plunking acorns into the leaves near a squirrel easily 30 meters away to keep the little jerk from littering the deck with jagged shards of shells. Ahem… but yeah, it’s a very satisfying and deeply rooted faculty, aiming and hurling projectiles at something small and furry and far away is at least as much a part of being human as walking upright and making tools, but only chucking stuff around requires the rapid distance and position calculation abilities we possess. Erectus ruled the world for nearly a million years, but they generally had to get up close to whatever they were trying to eat. Neandertals were around for a quarter of a million years by the time we started roaming out of Africa, clearly they were good at surviving, but the ability to reach out and touch something accurately and reliably was probably the reason we wound up taking over the whole planet. Now that same ability enables you to play a relaxed game of catch with a little kid, safe and secure in a world where we managed to get out of the food chain entirely… pretty good work I say! Probably why we like cameras, a small part of your brain is wondering what sort of sling or bow you would need to hit a target where that camera is viewing, I bet. Thanks! I added that picture to the post. I’m planning to sit down when I get a bit of time and respond to your other messages, which I find helpful. Maybe over the weekend. I can always be counted on to pull up a picture of a bear from a video, and let no one say otherwise. Here’s an idea, but only if it’s feasible as well as easy to implement. How about a link at the top of the post to the most recent or today’s update, as a click on it would take you to the start of the Friday the 13th updates. Yes, it’s Friday the 13th. Expect the ice to hit the fan. It takes you to the top of the comment section which is right below the most recent updates. Good tip, Max. That will help. Sept 1 evg: “necessisarily” is mississispelled! Thanks. Spell check must have been on vacation. Seem to recall I saw “is suppose to be” in there, too. 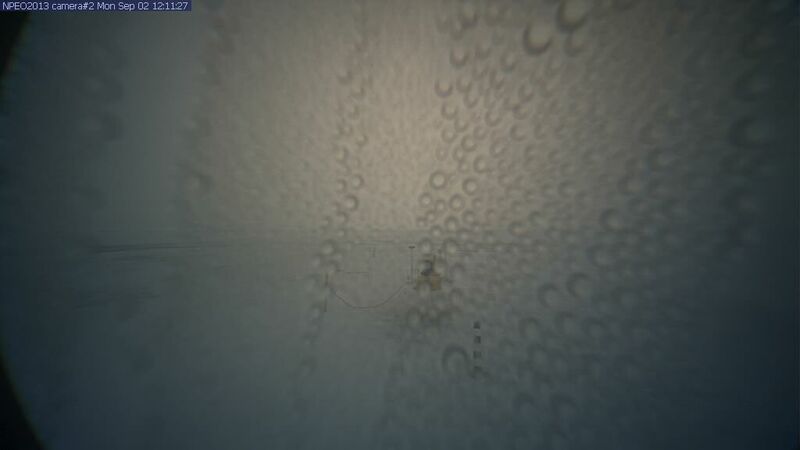 D-dropped a d.
Perhaps your camera has learned to tack against the wind? Maybe I spent too much time watching America’s Cup the other day, though. When I was a kid in the 1960’s they used to have America’s Cup trials out in Buzzard’s Bay, and we’d take a tiny “sailfish” (basically a surfboard with a sail)out to race the big yachts, when the wind was nearly calm and those huge and heavy sails hung limp. We’d sail rings around them, until the wind rose a bit. I’ve been wondering a lot about the “wind vane” at our camera.  One thing I’ve started to consider is that the entire block of ice our camera is on has pivoted around, so that what was north in April is now south. Hi Caleb, Have been enjoying your post for a while now. to monitor sunrise and sunset times at different locations on the planet. 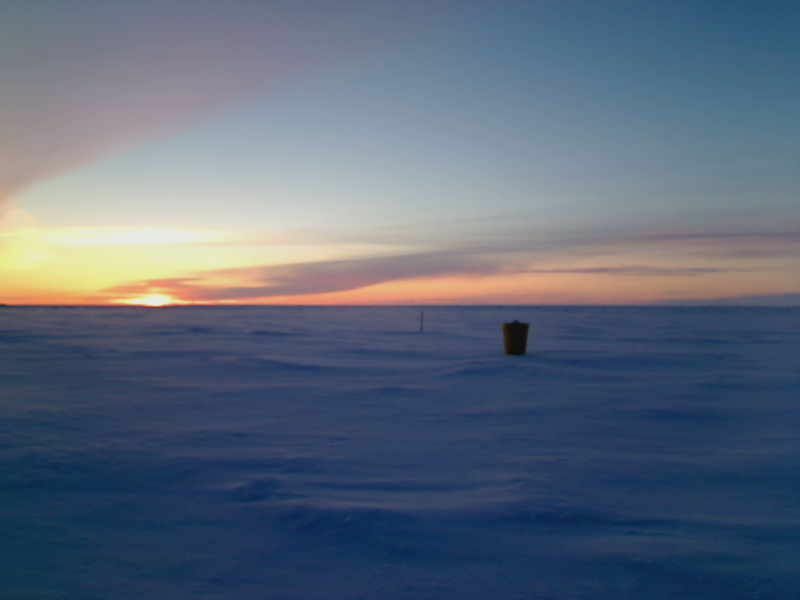 Have recently added the location of your buoy to see what sunrise and sunset is there. One very cool feature (click on the analemma button) this software has is the angle above the horizon the sun is at solar noon. 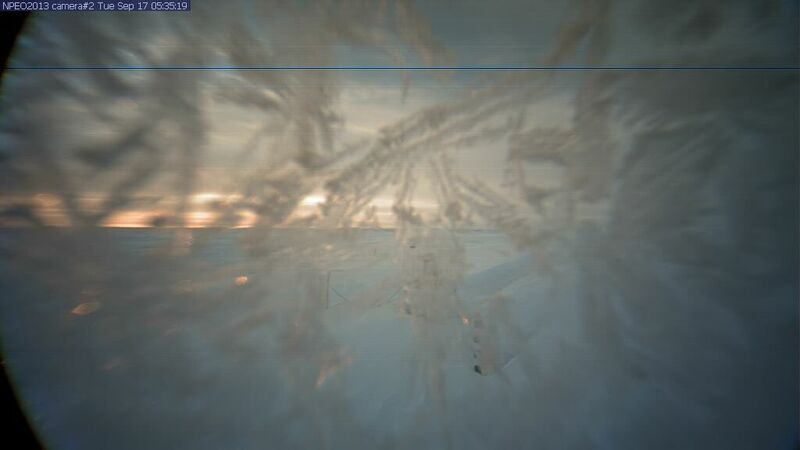 Right now the sun is barely 8 degrees above the horizon. This angle is very useful when computing the insolance at a location. Thanks for the link. And I’m glad you enjoy my meandering thoughts. Thanks for stimulating my thinking. I think I’ll do a short post on this.